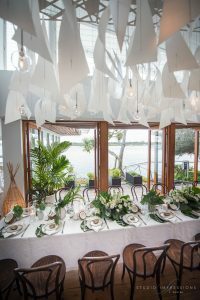 Showcasing the contemporary style of luxury island dining. 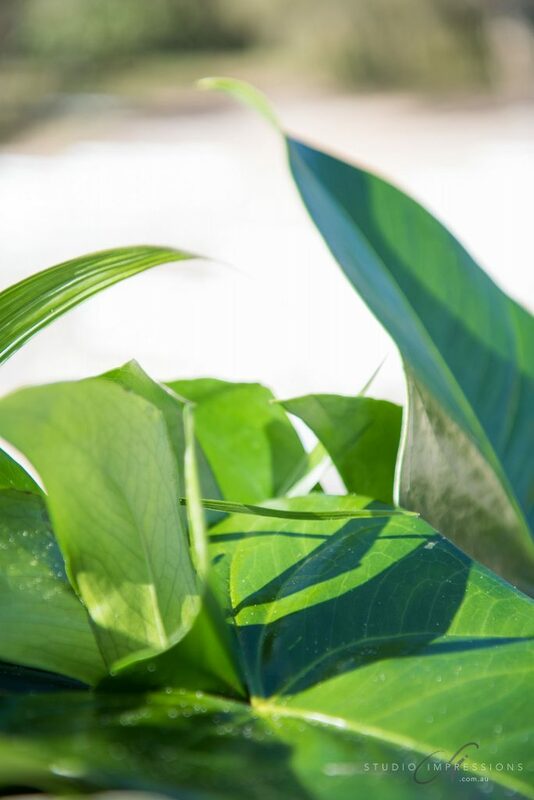 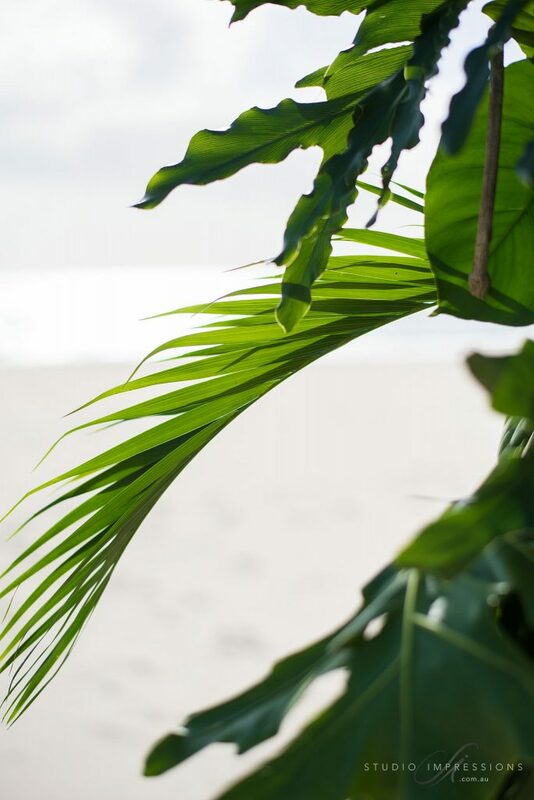 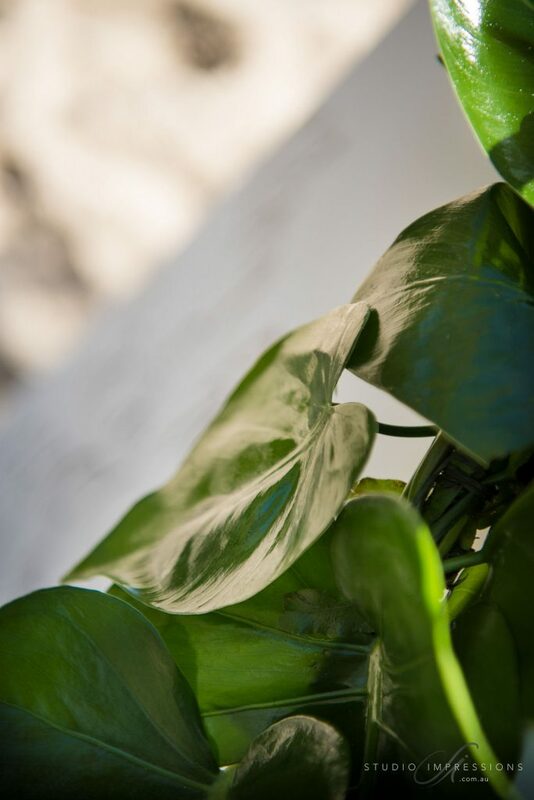 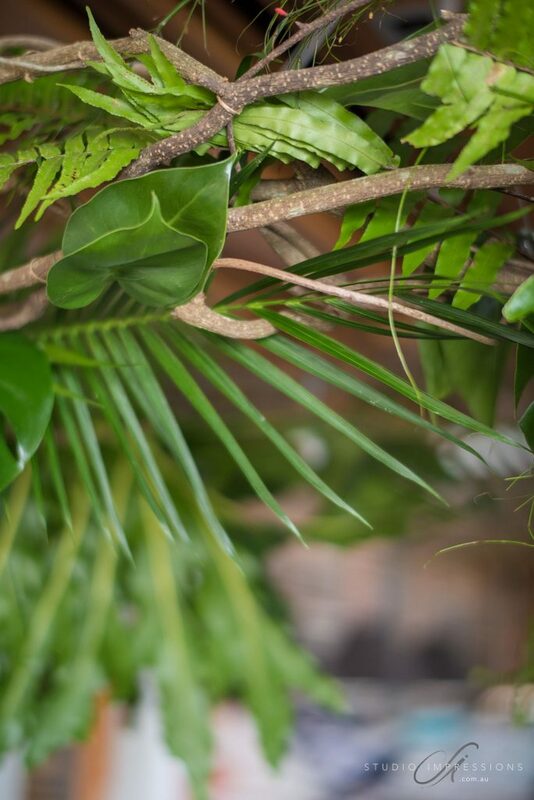 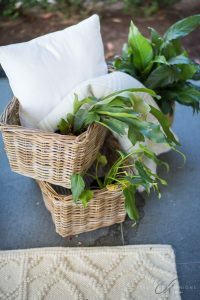 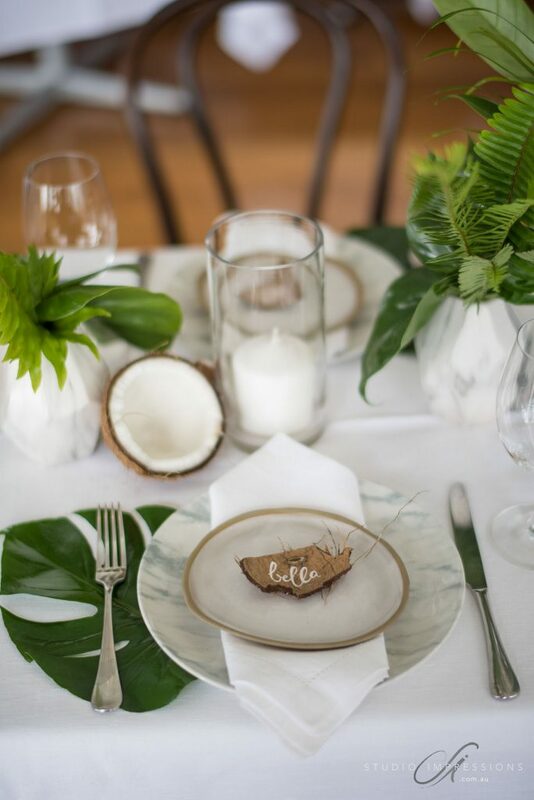 This colour palette features a base palette of Ivory & Crisp White, to which we have added Natural Raw Timbers & Coconut Husk with a sharp pop of Charcoal Black, and complimented by Copious amounts of Lush Natural Foliage & Tropical Greens. 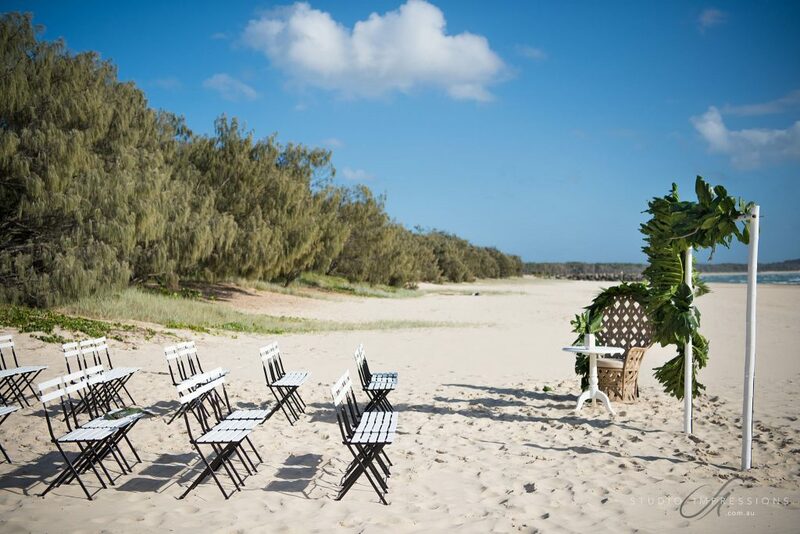 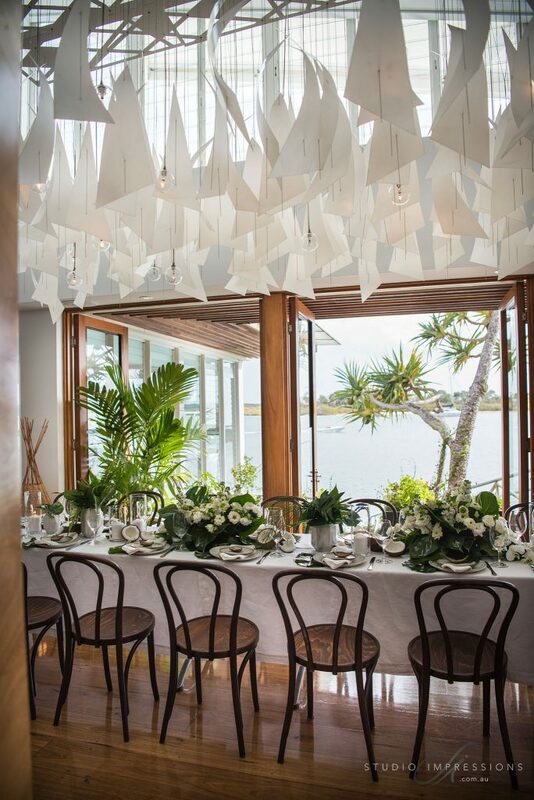 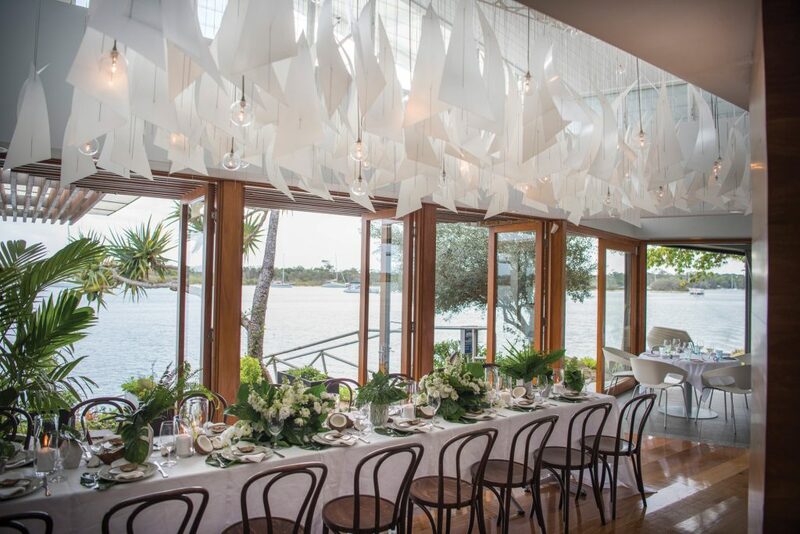 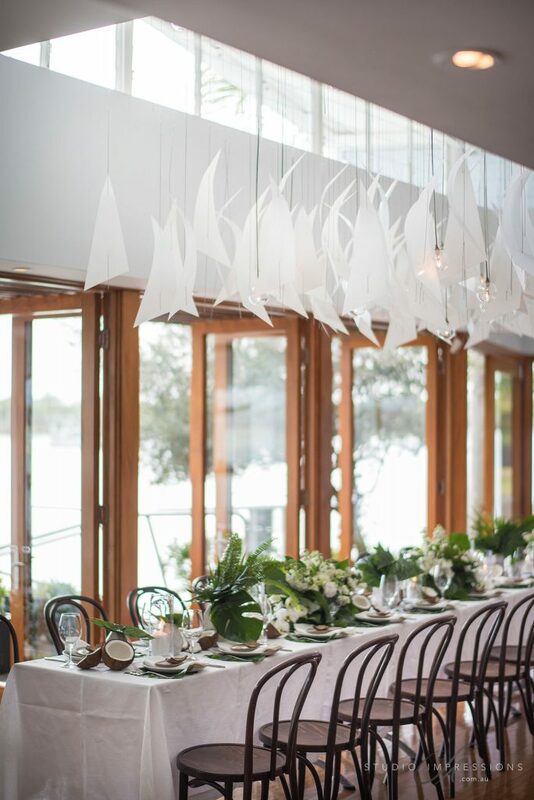 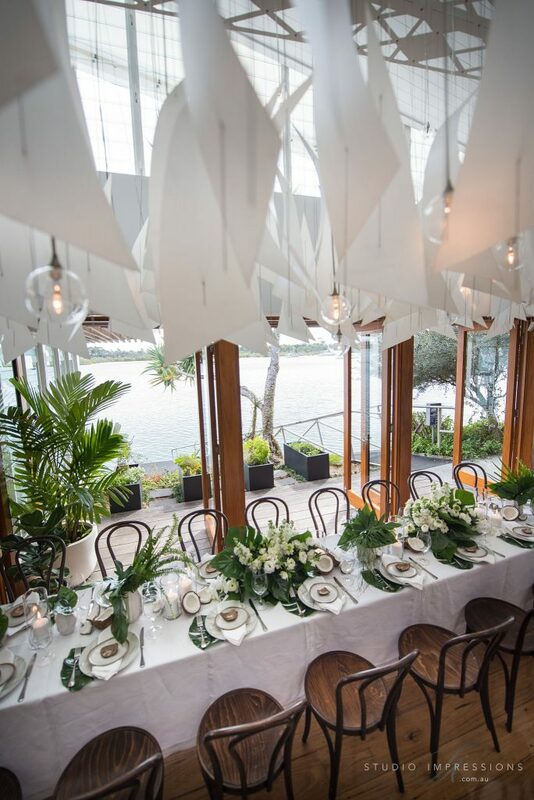 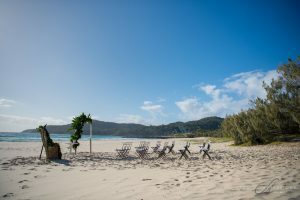 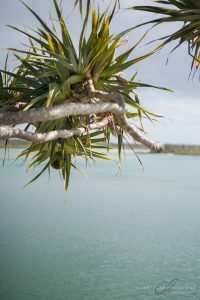 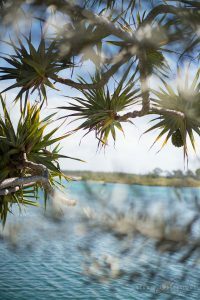 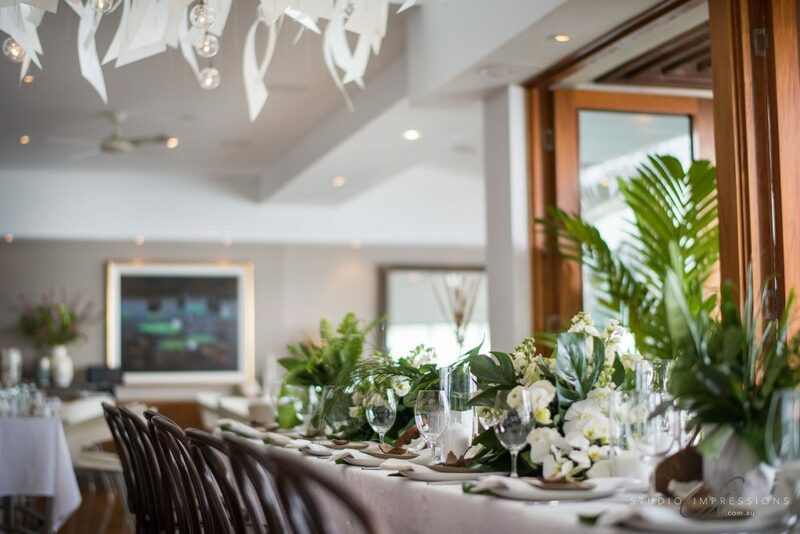 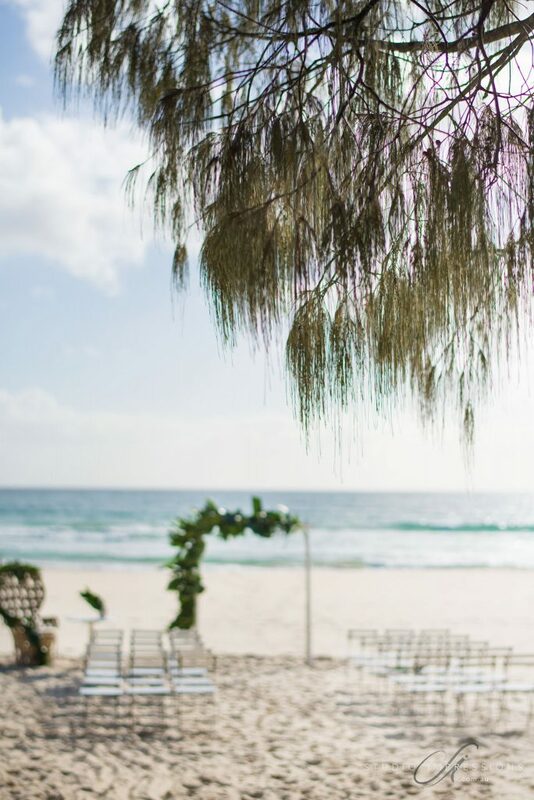 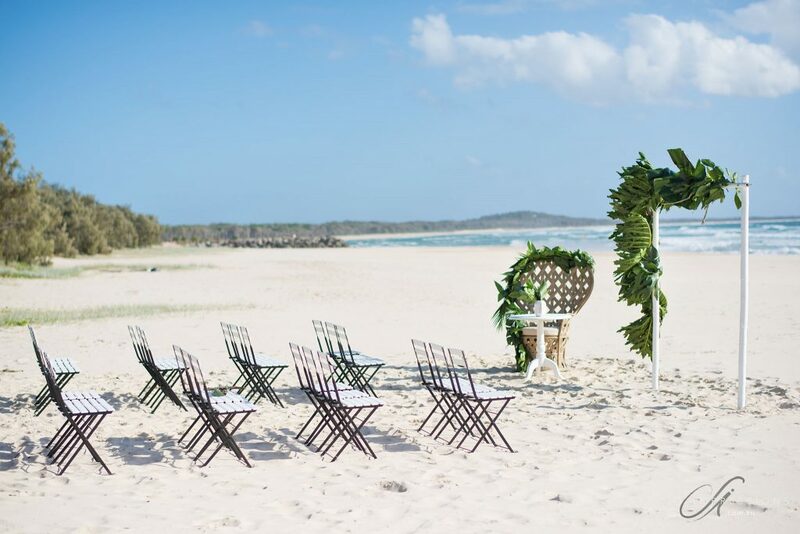 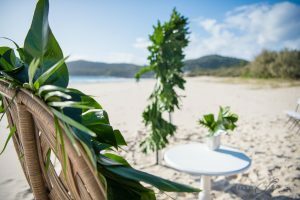 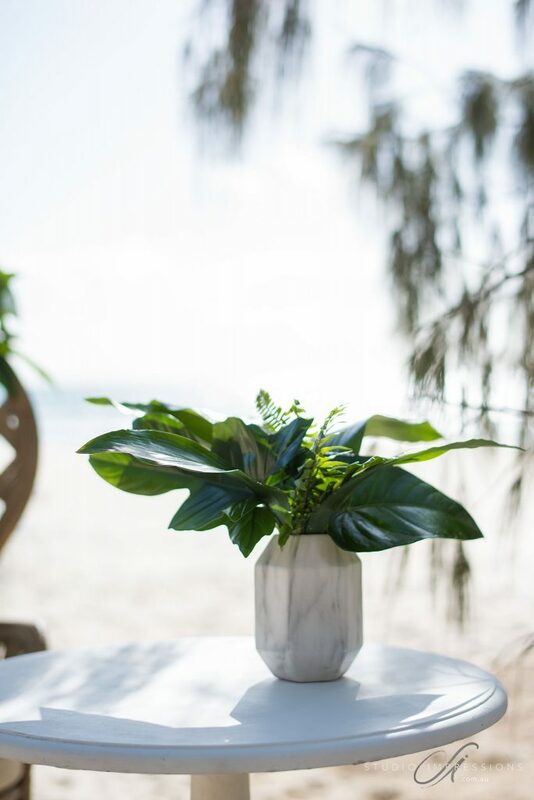 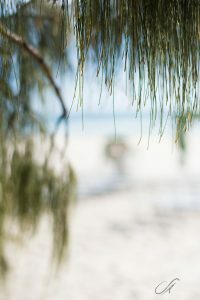 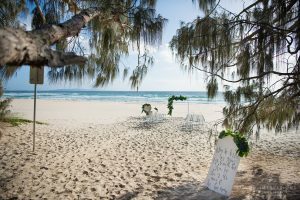 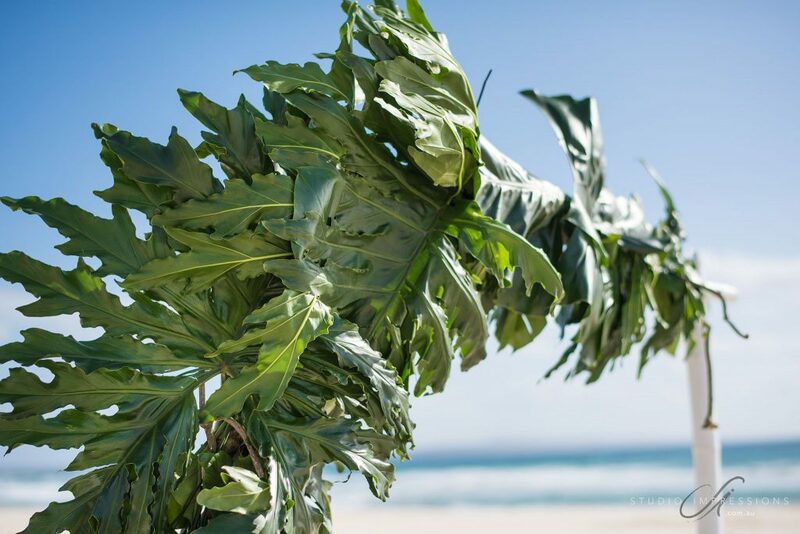 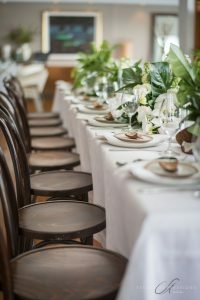 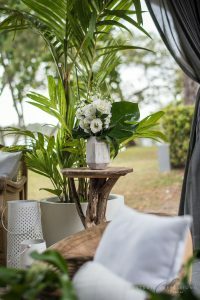 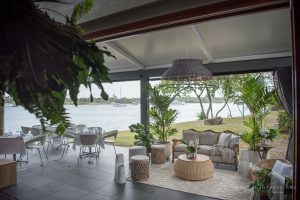 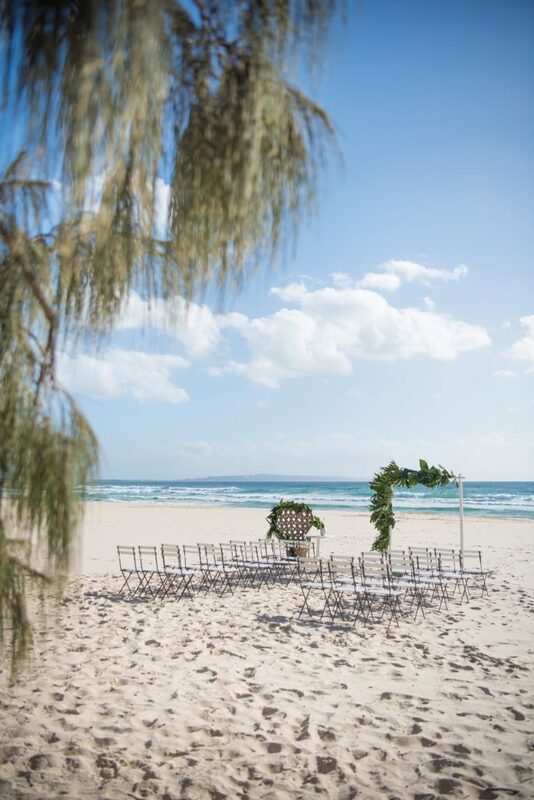 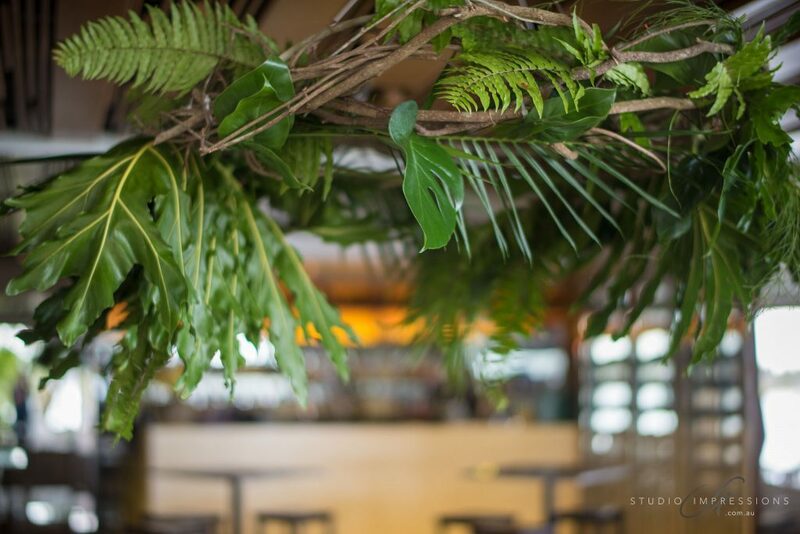 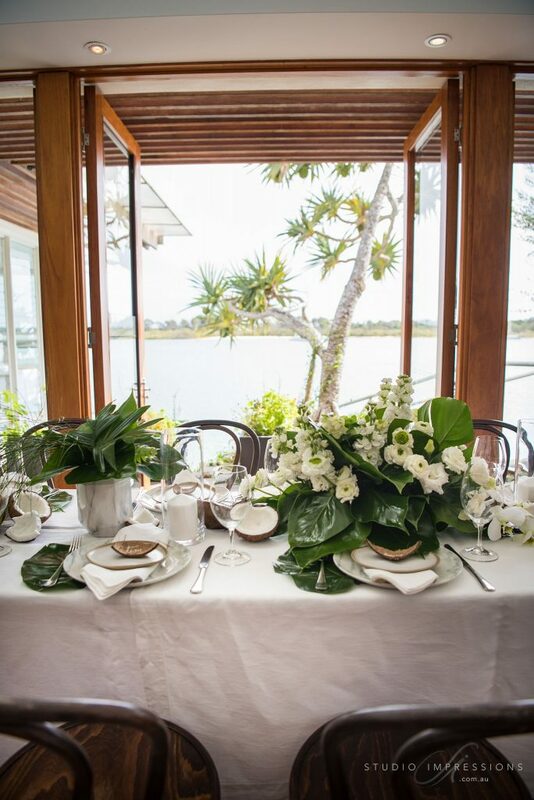 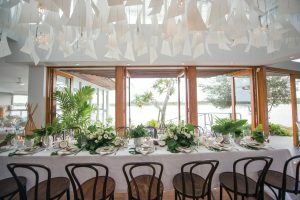 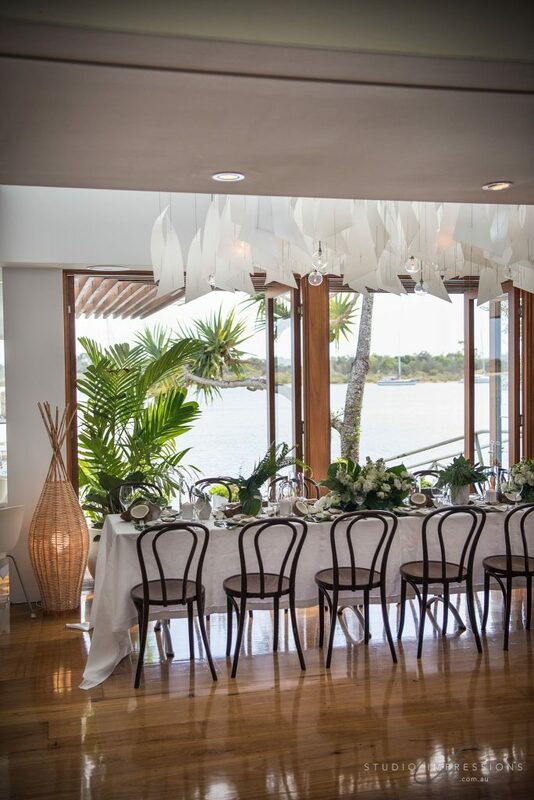 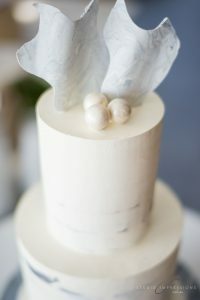 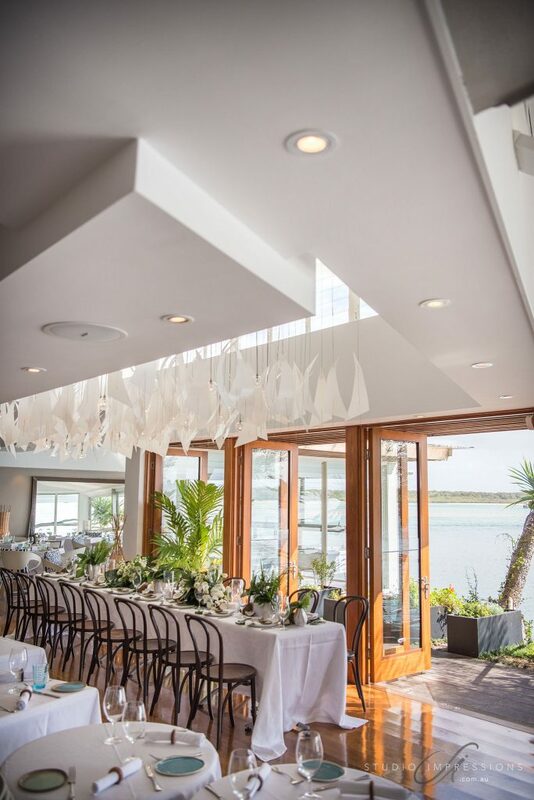 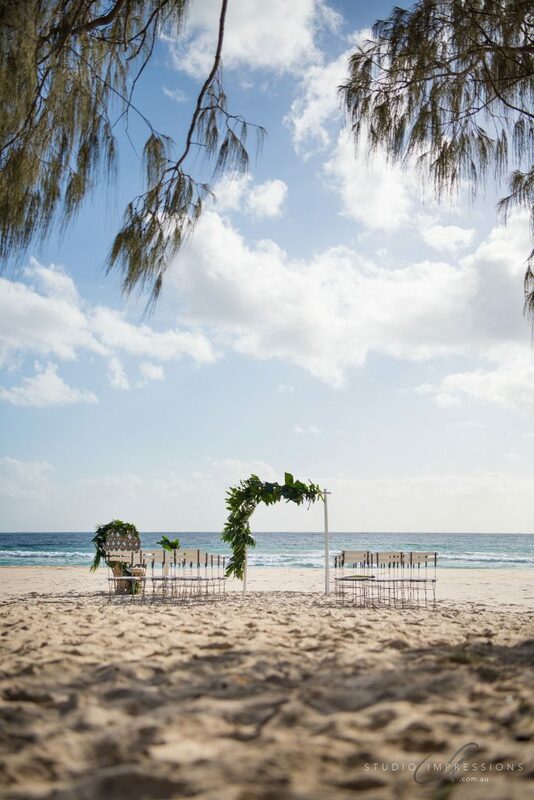 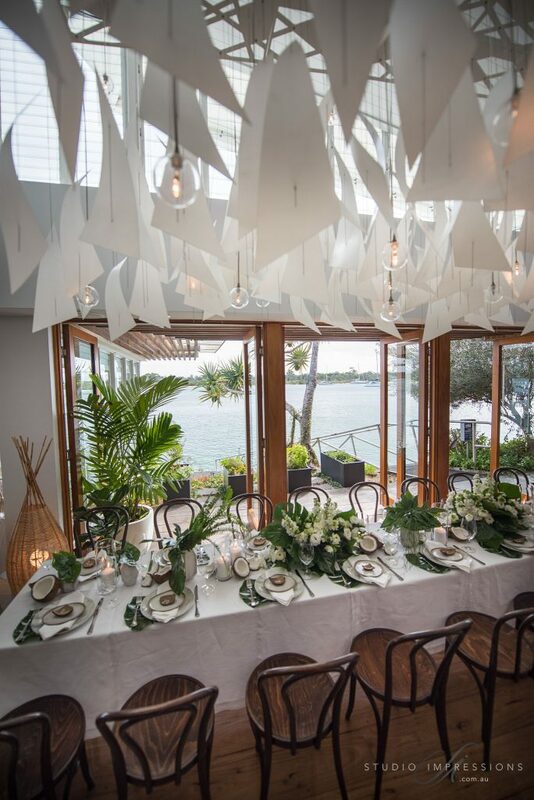 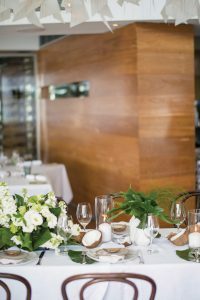 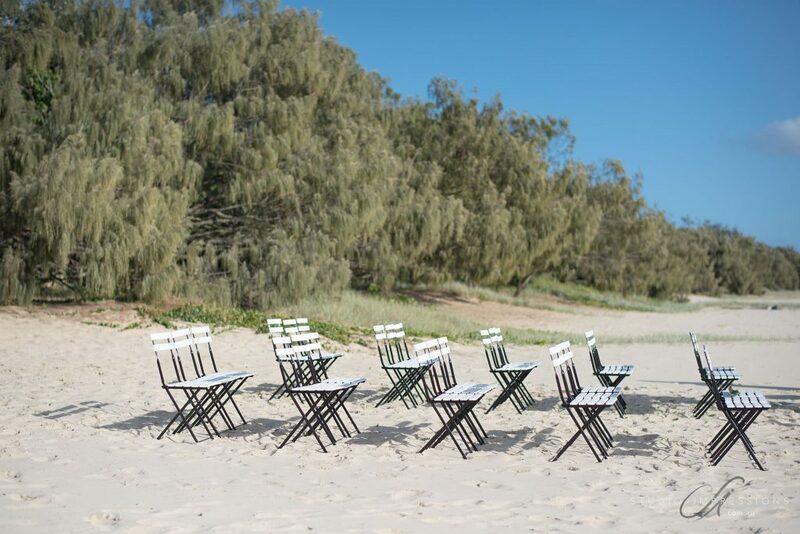 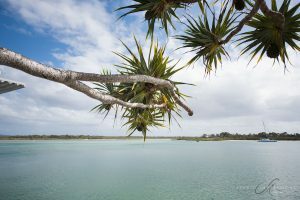 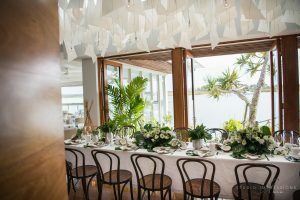 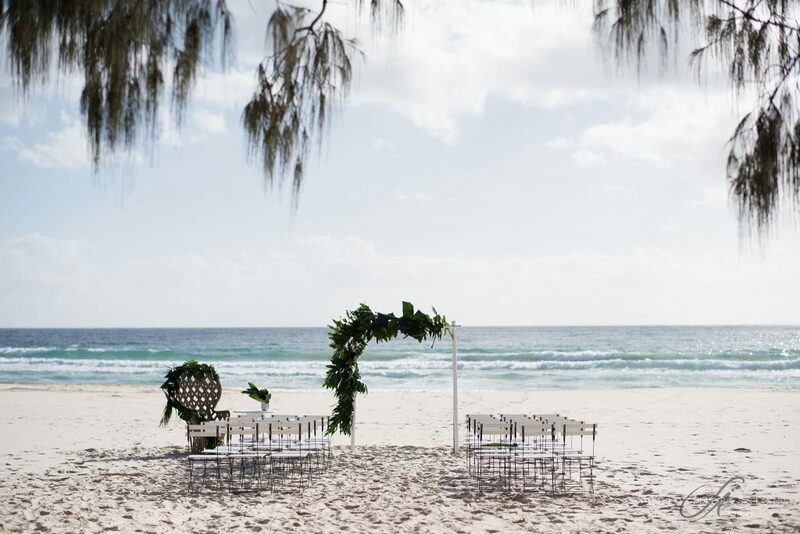 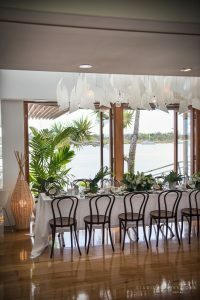 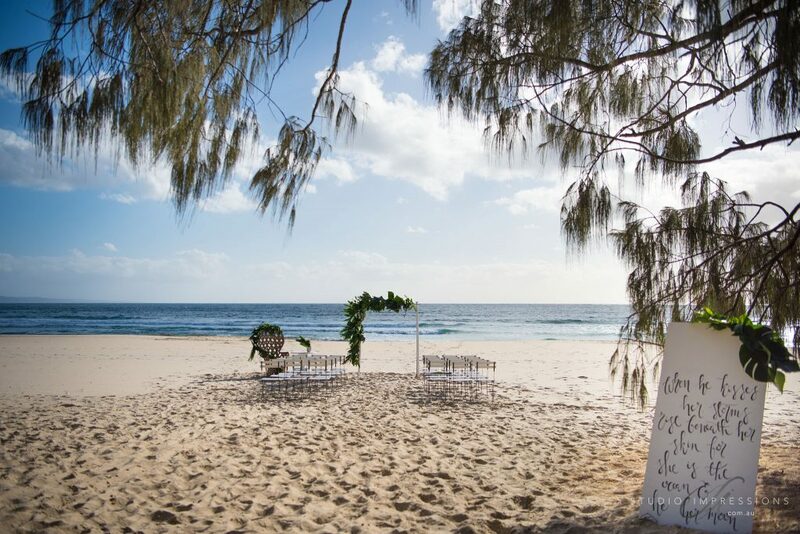 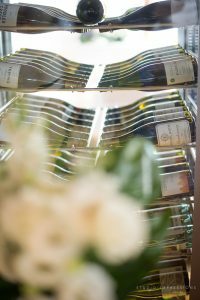 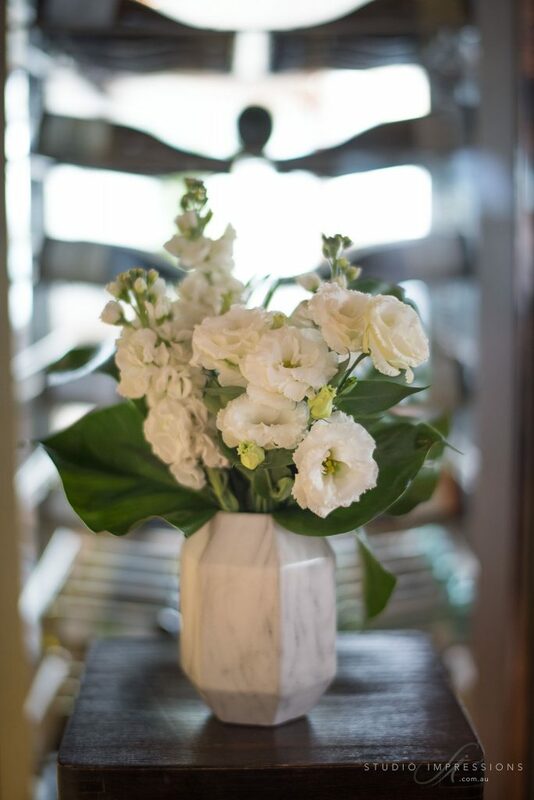 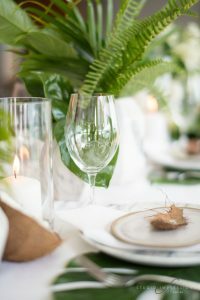 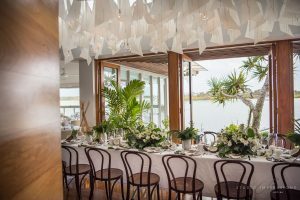 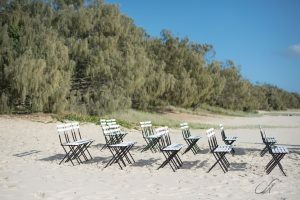 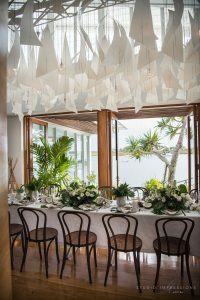 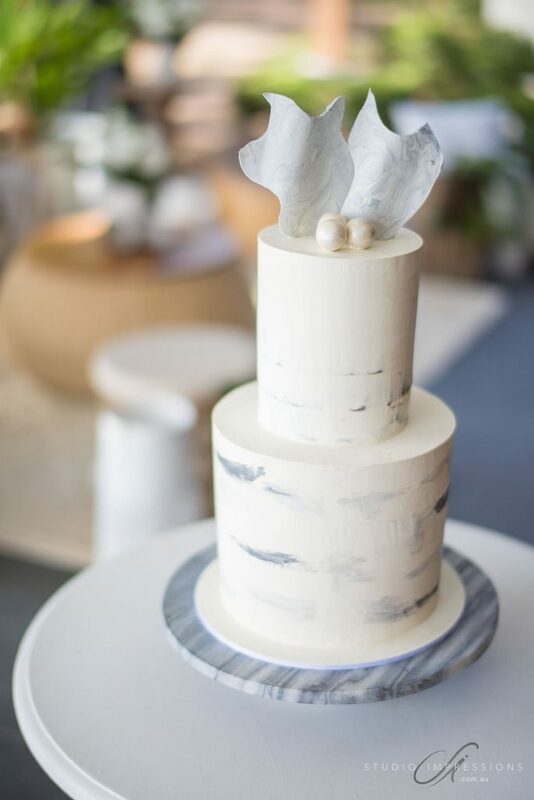 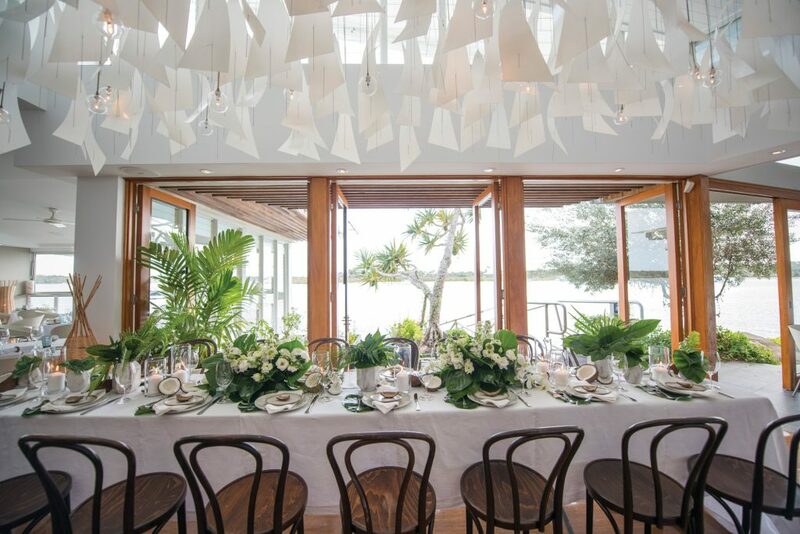 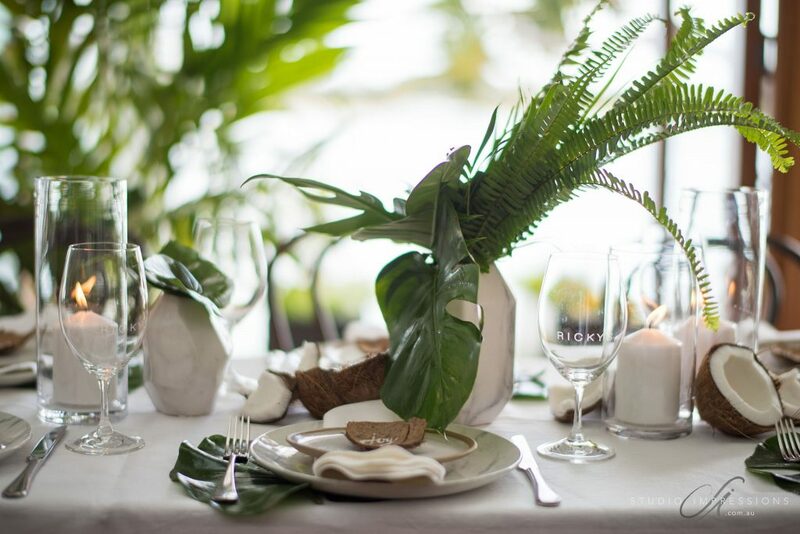 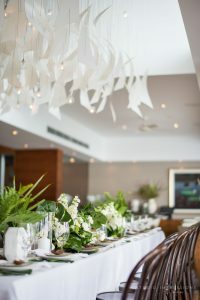 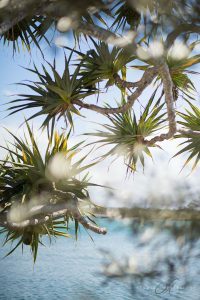 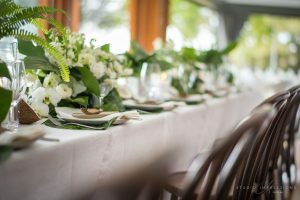 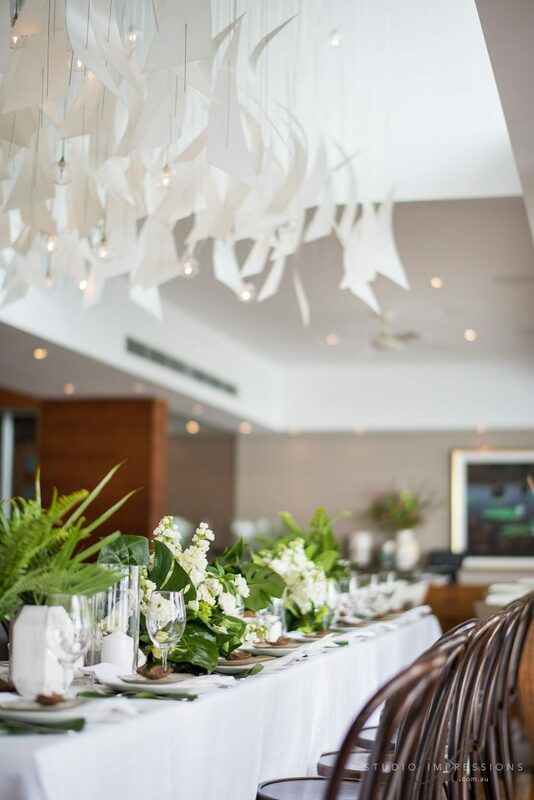 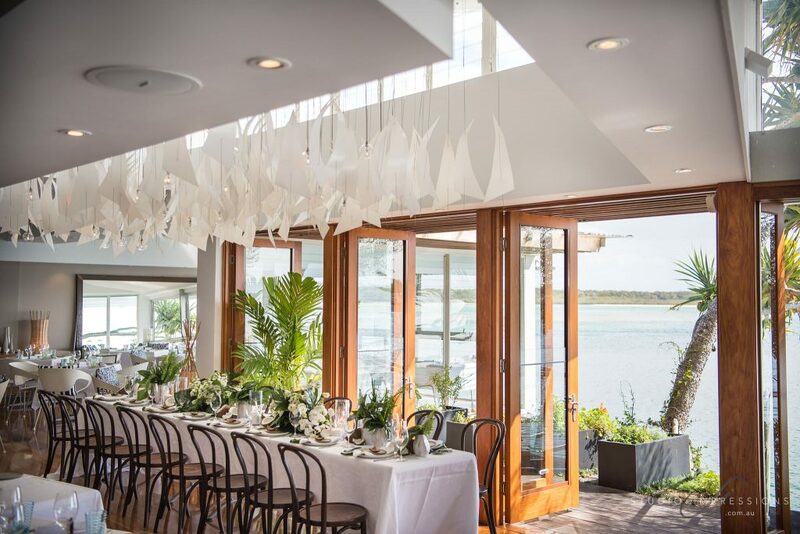 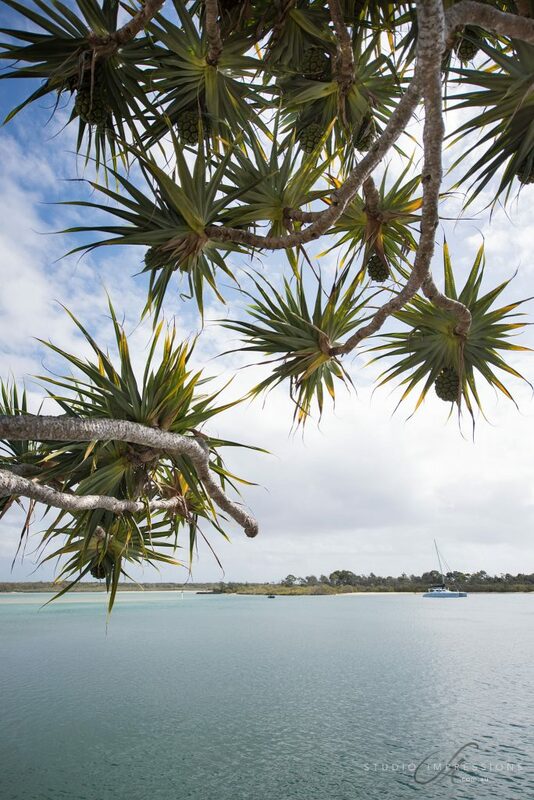 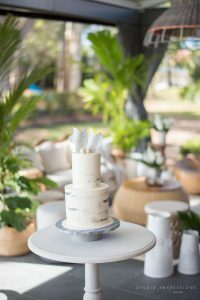 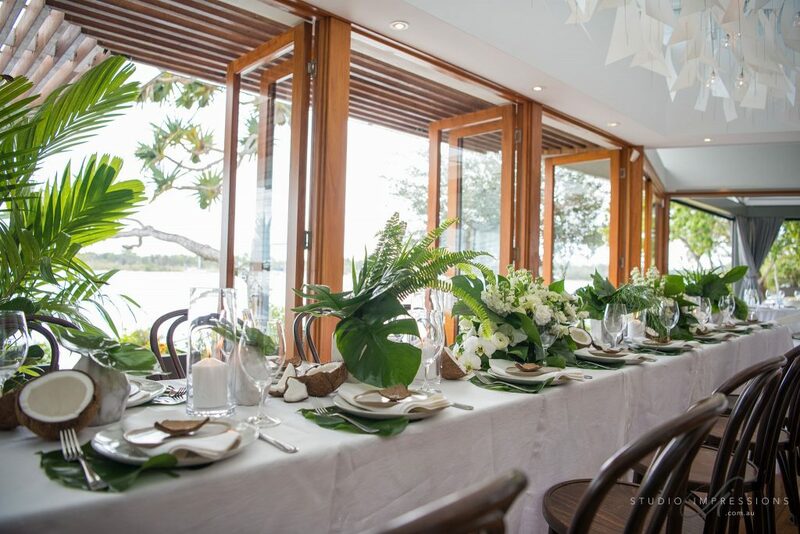 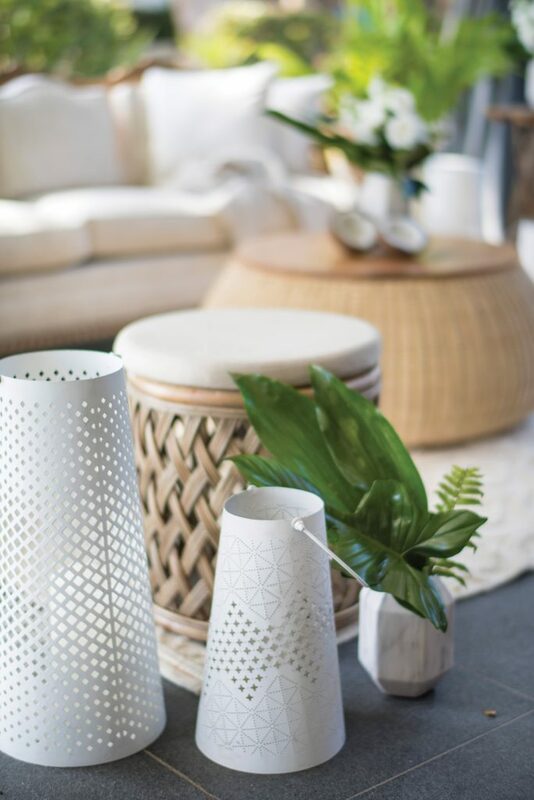 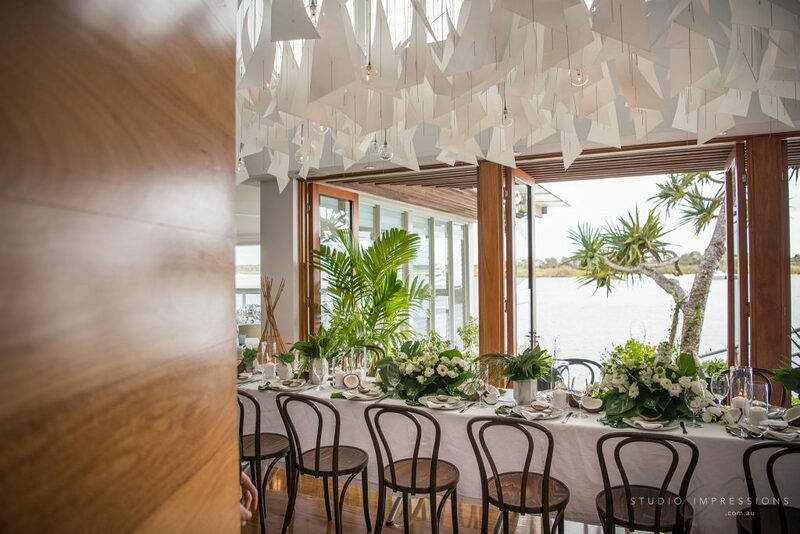 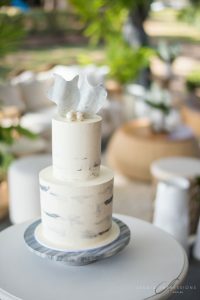 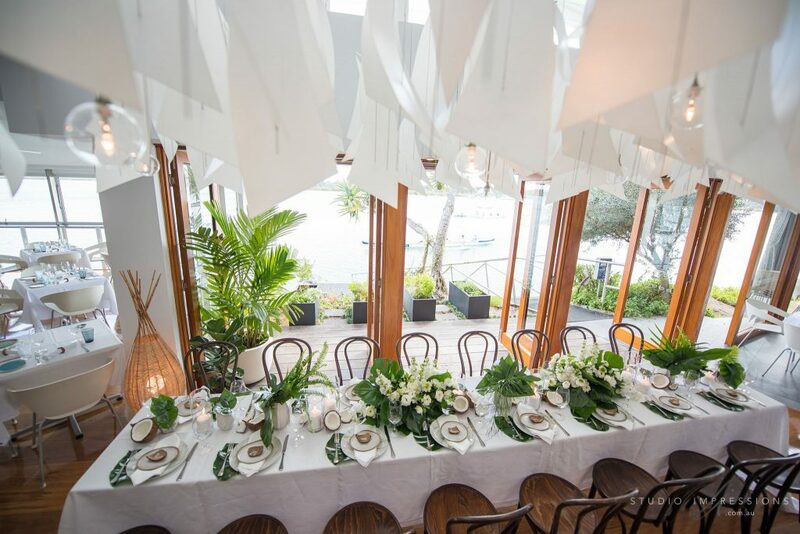 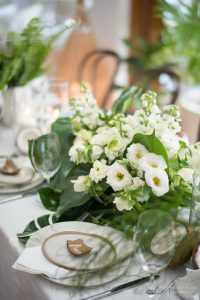 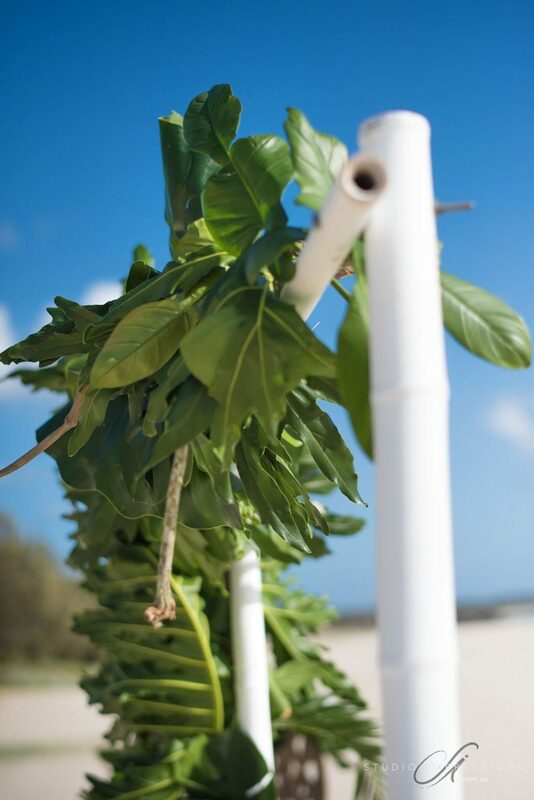 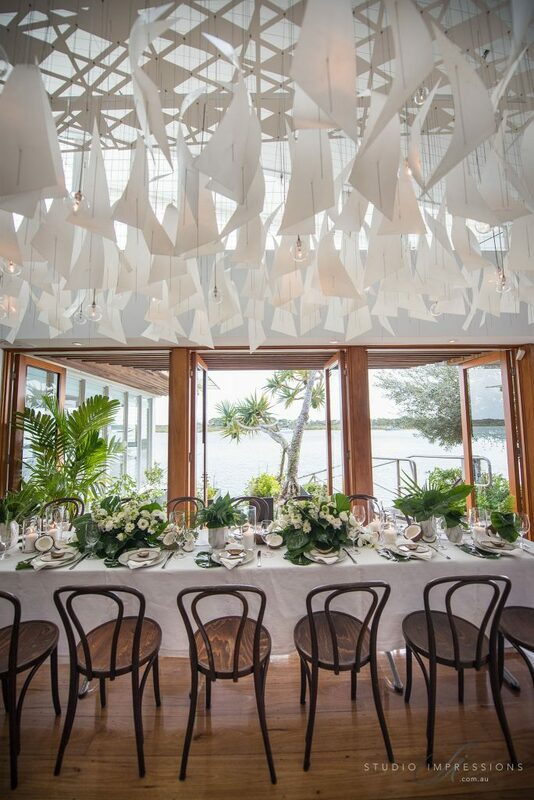 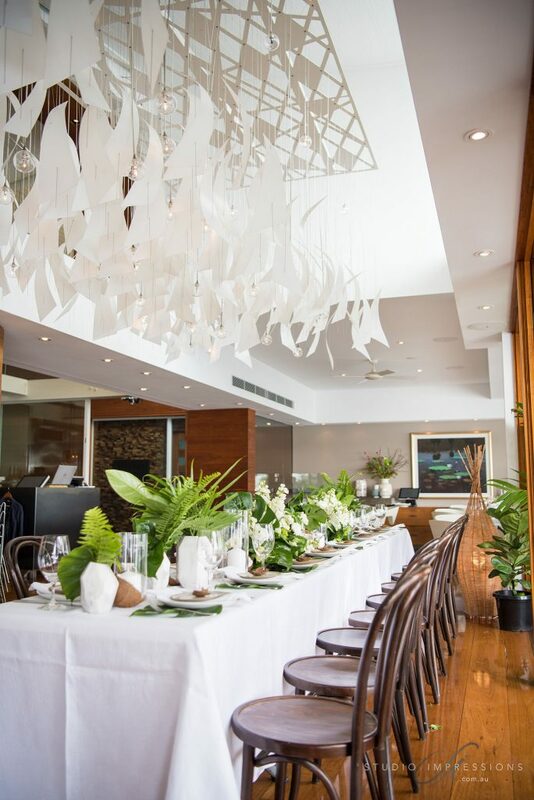 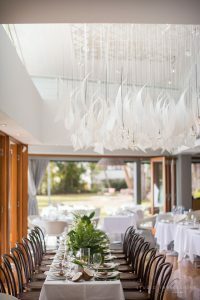 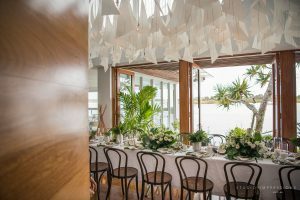 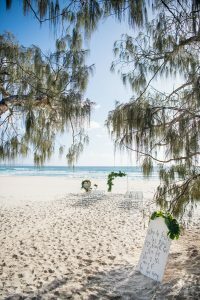 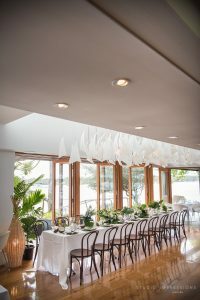 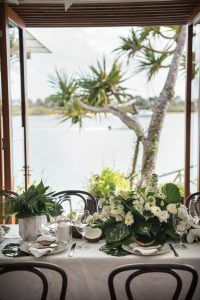 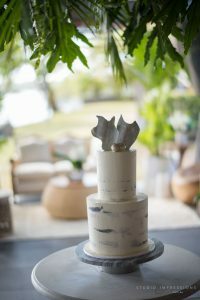 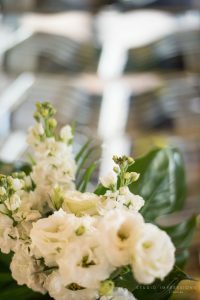 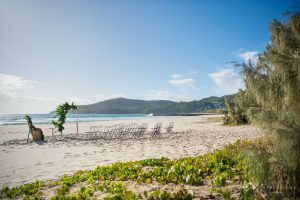 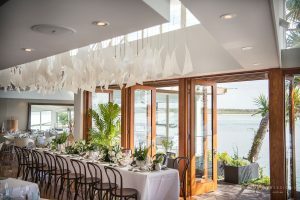 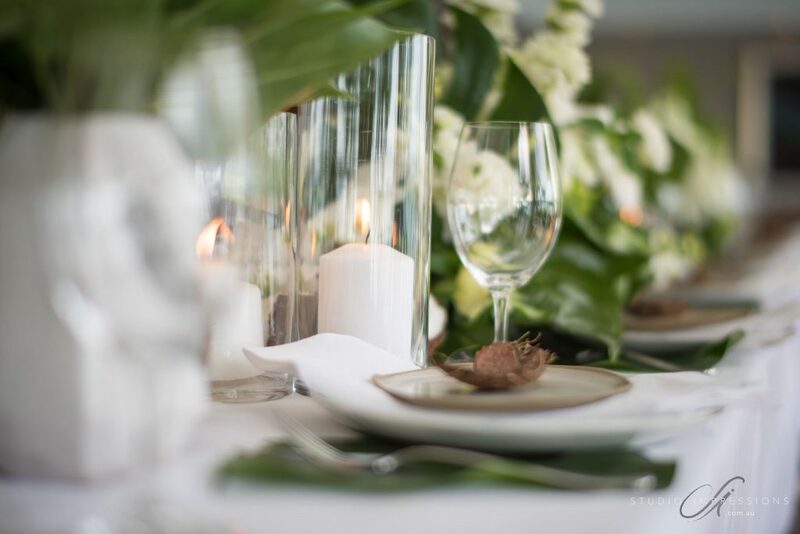 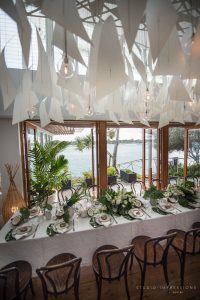 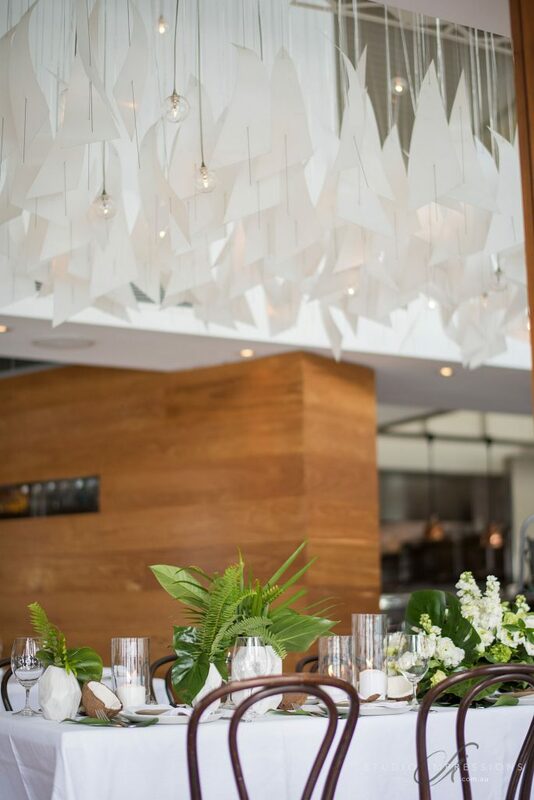 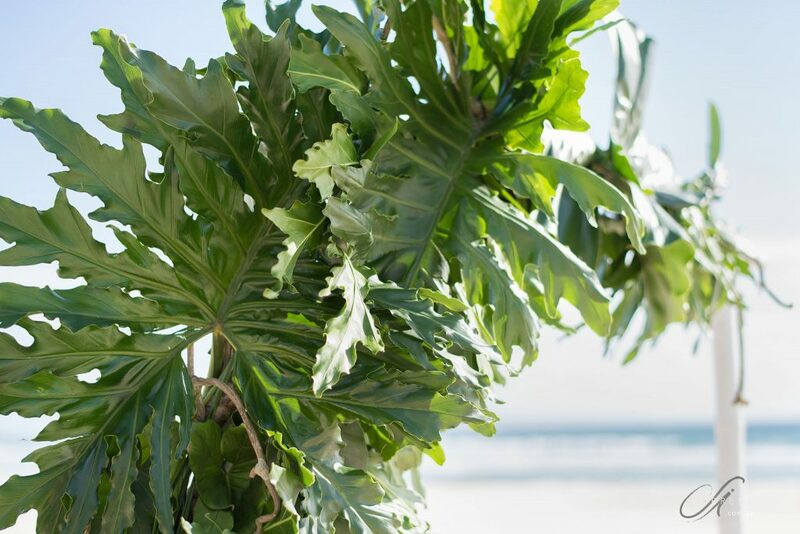 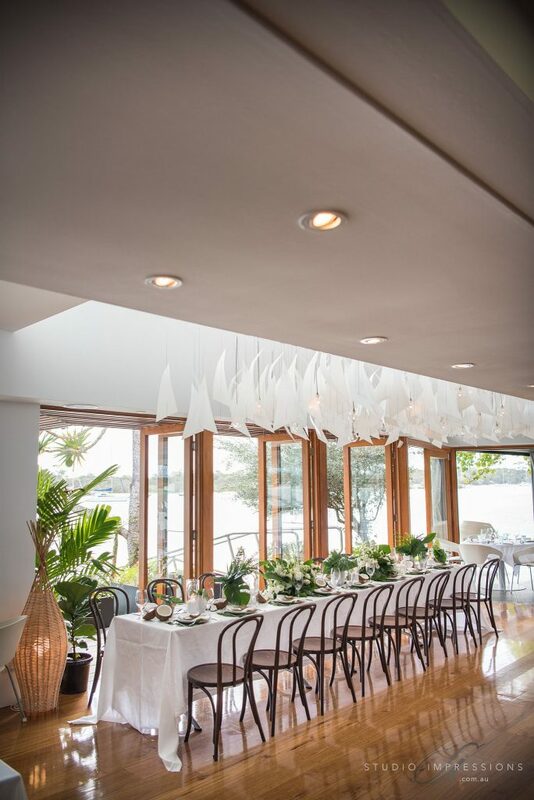 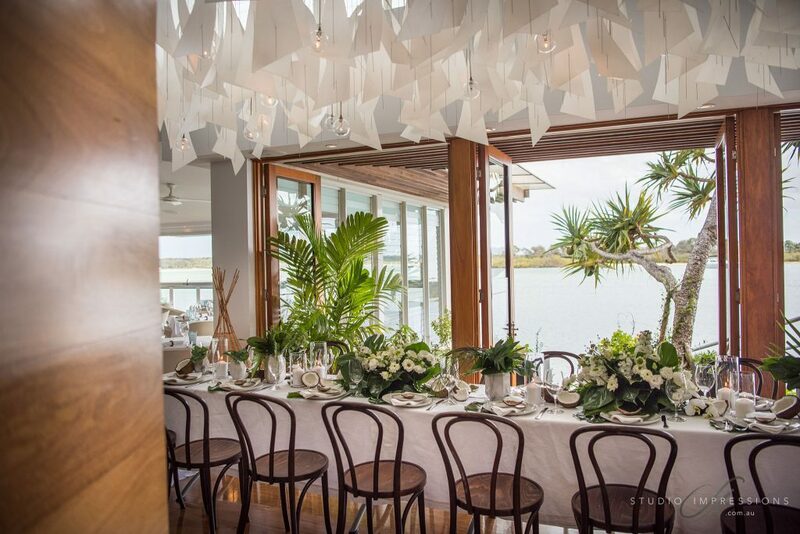 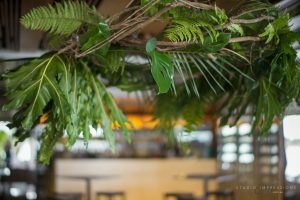 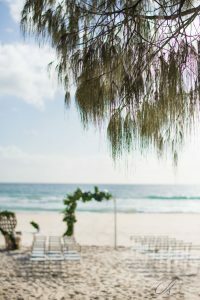 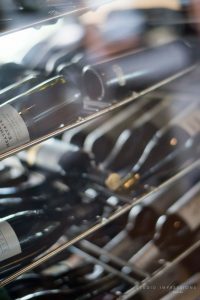 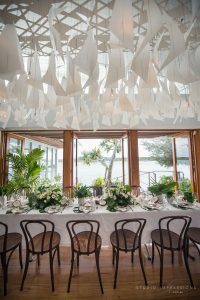 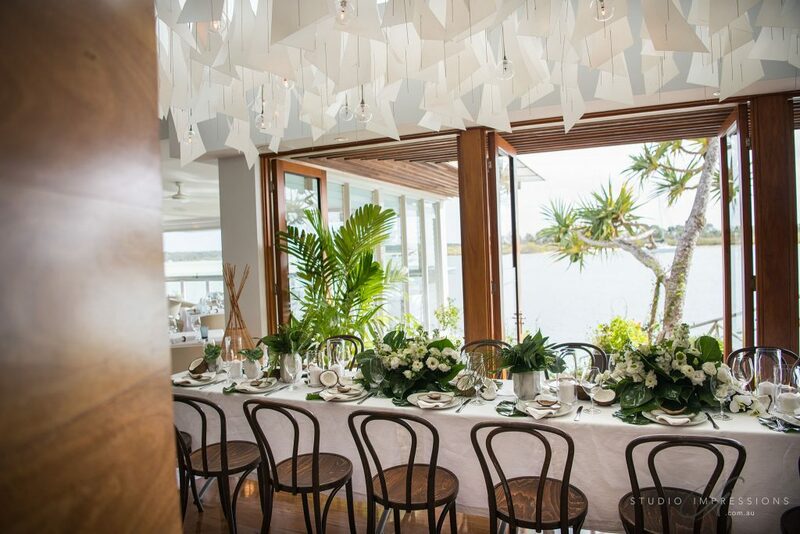 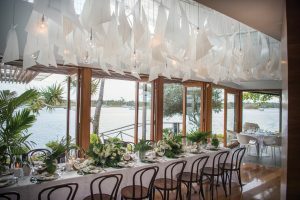 Our styled shoot takes place at Rickys Noosa, a fine dining restaurant on the Noosa River, and one of the Sunshine Coast’s most stunning waterfront wedding venues. 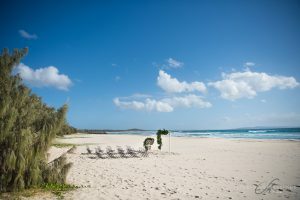 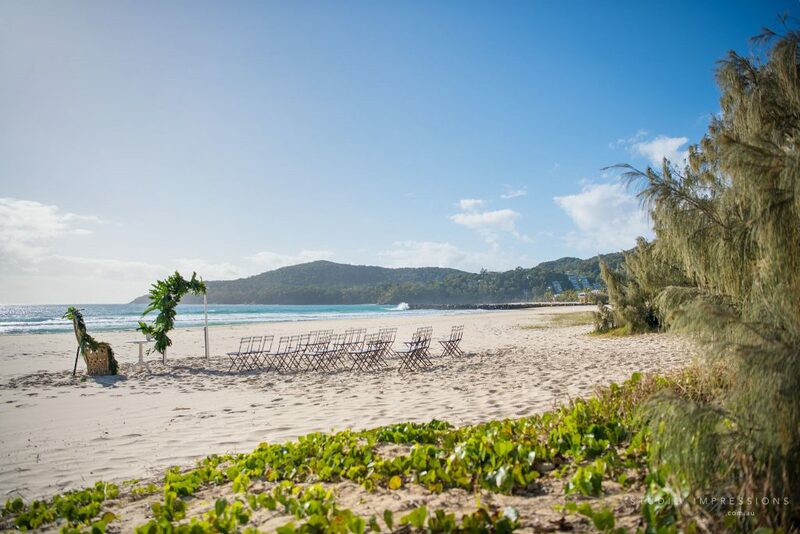 The ceremony at Access 12 was designed to feel like we were on a deserted island. 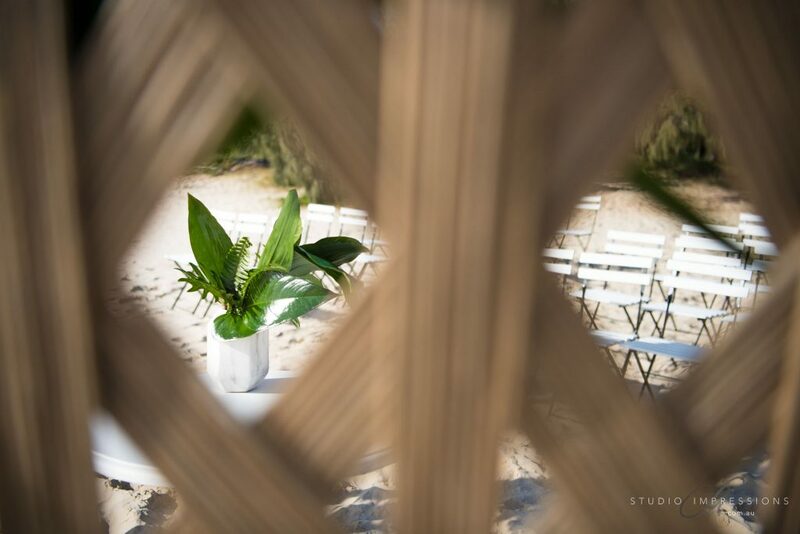 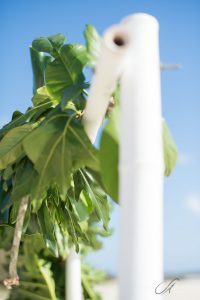 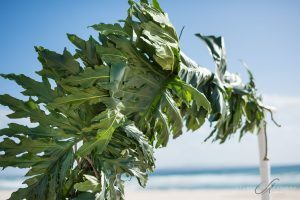 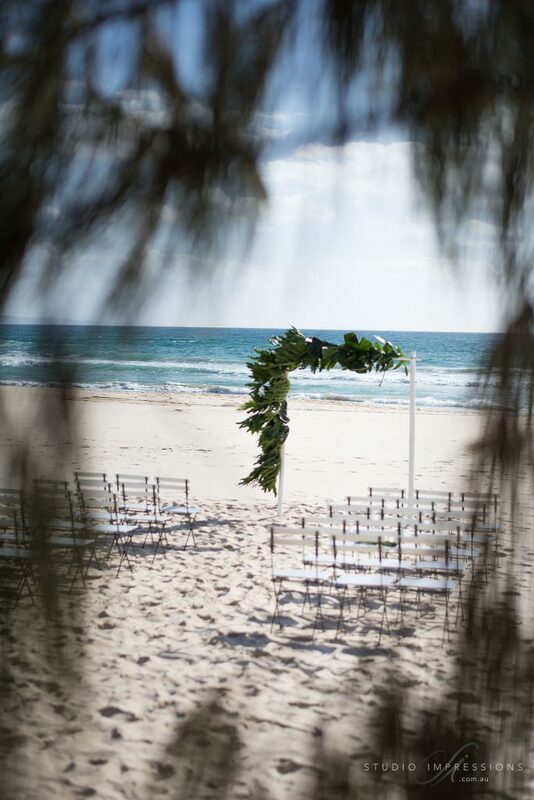 With just the ocean as the backdrop, a white bamboo arch featuring a lush tropical foliage garland created a focal point and a window to the ocean view. 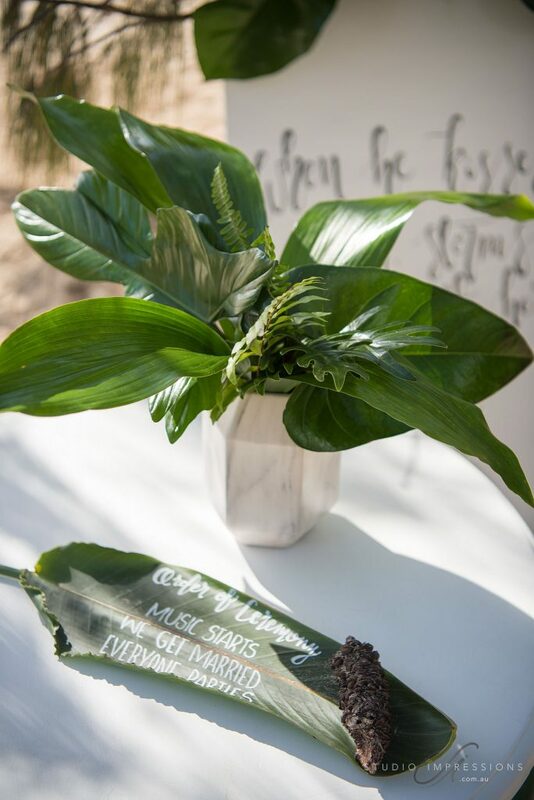 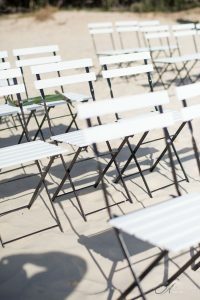 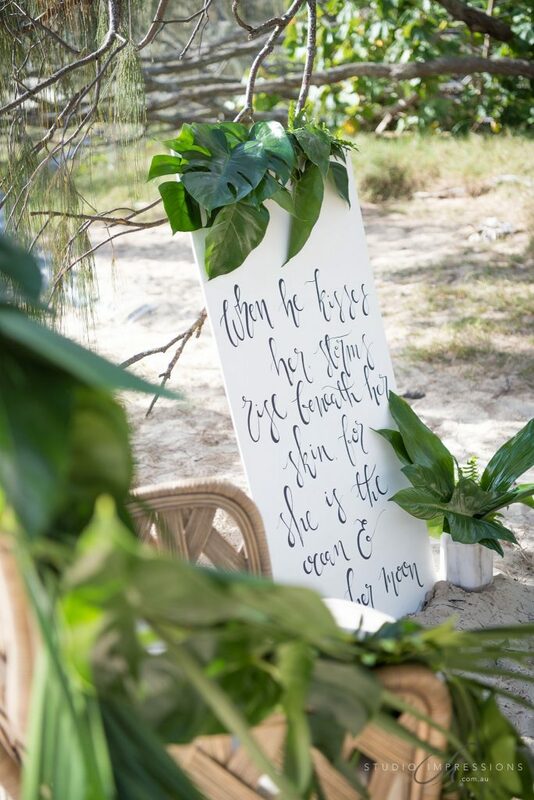 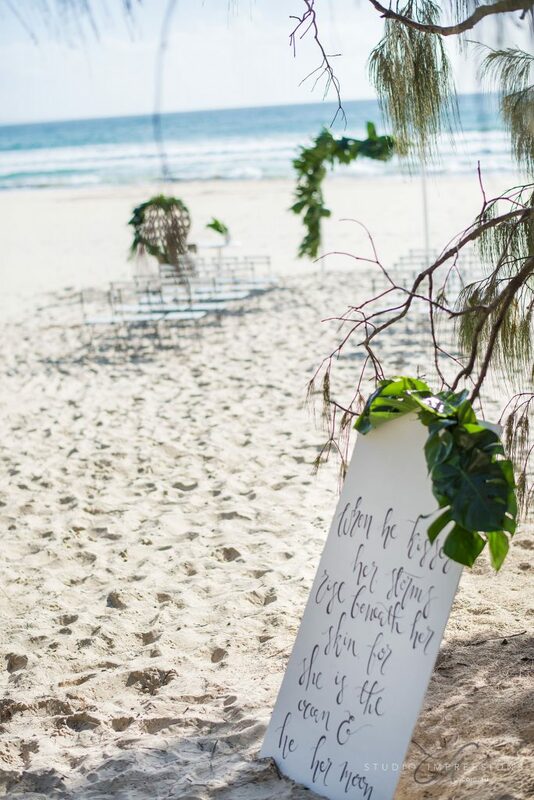 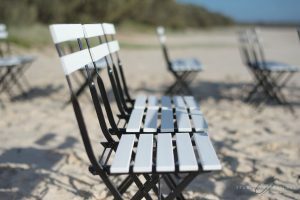 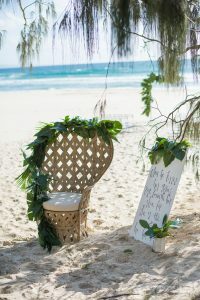 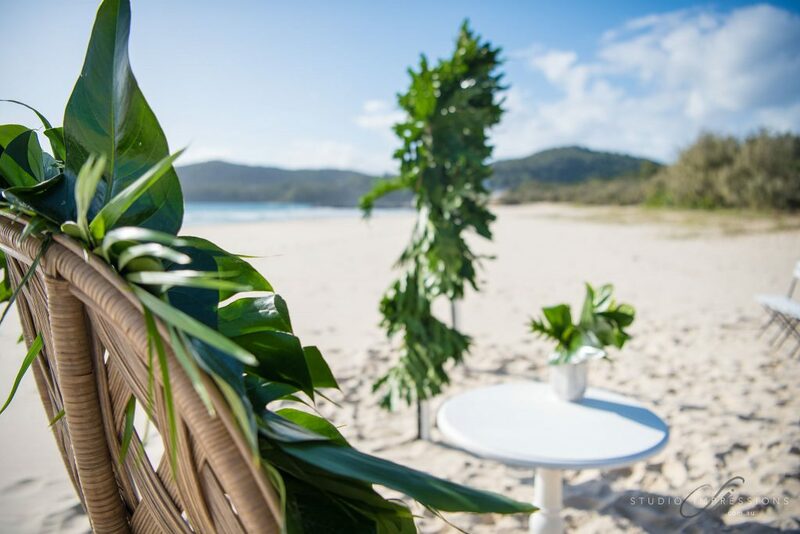 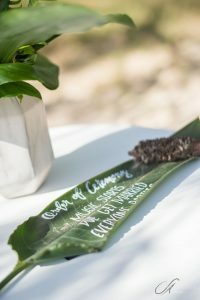 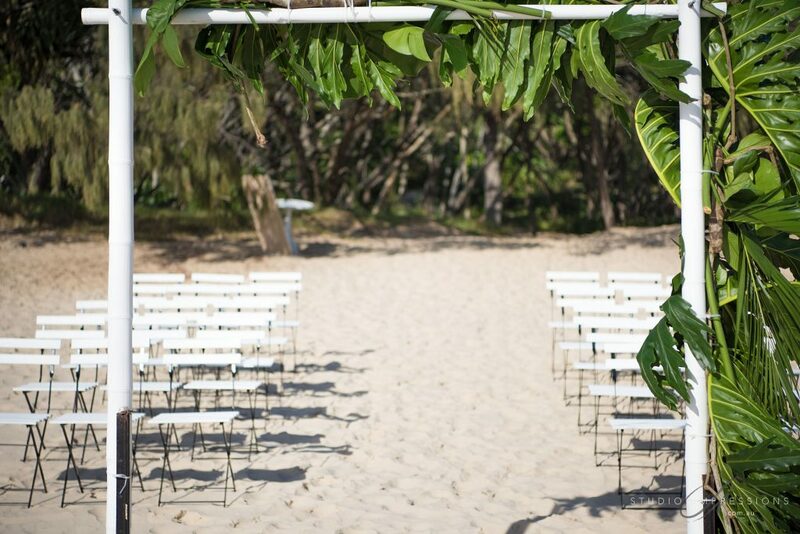 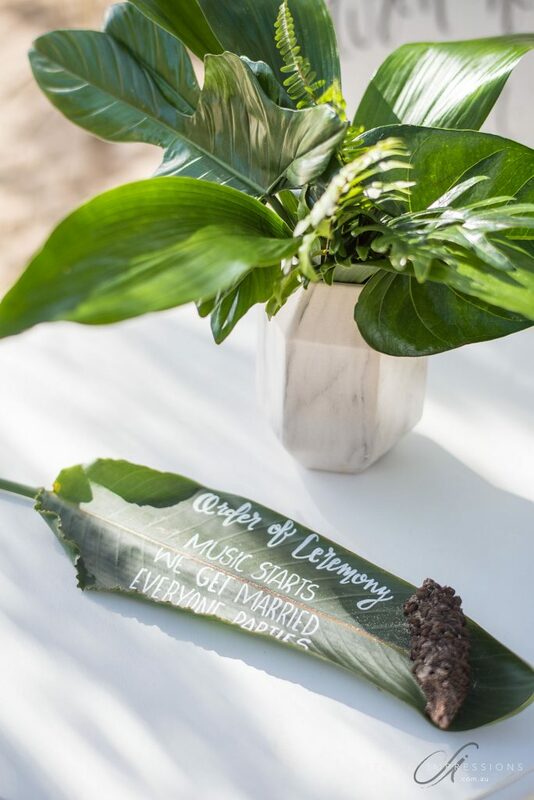 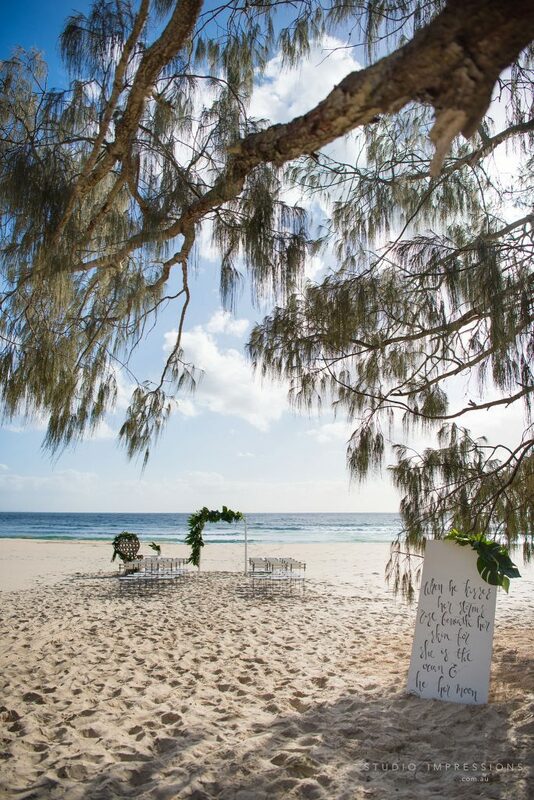 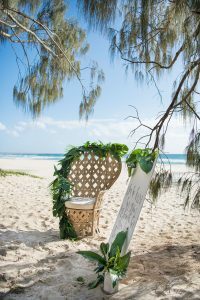 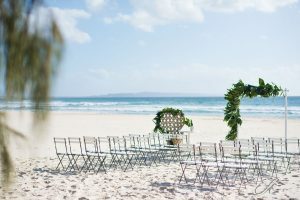 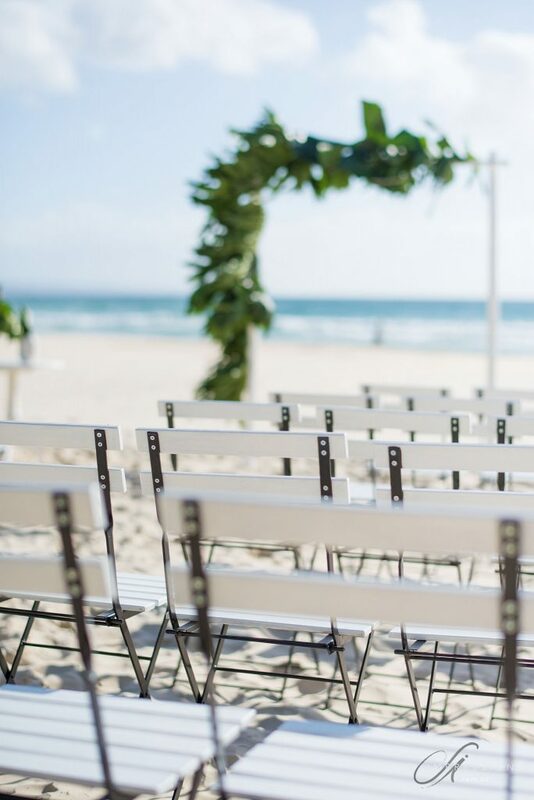 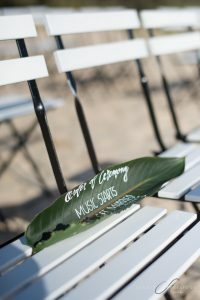 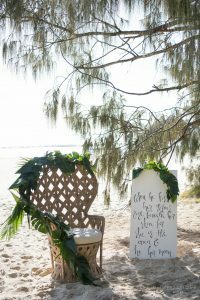 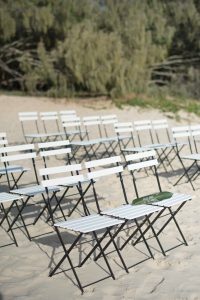 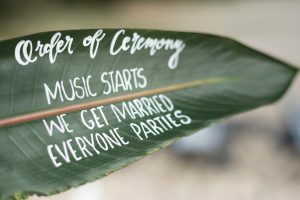 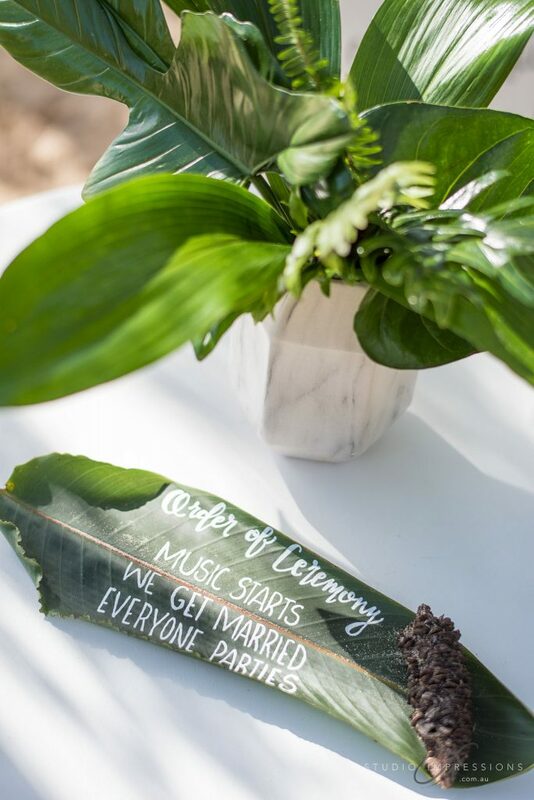 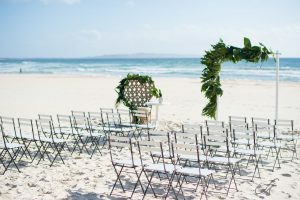 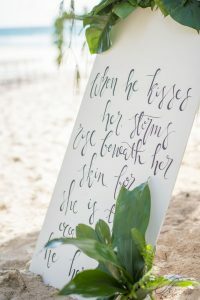 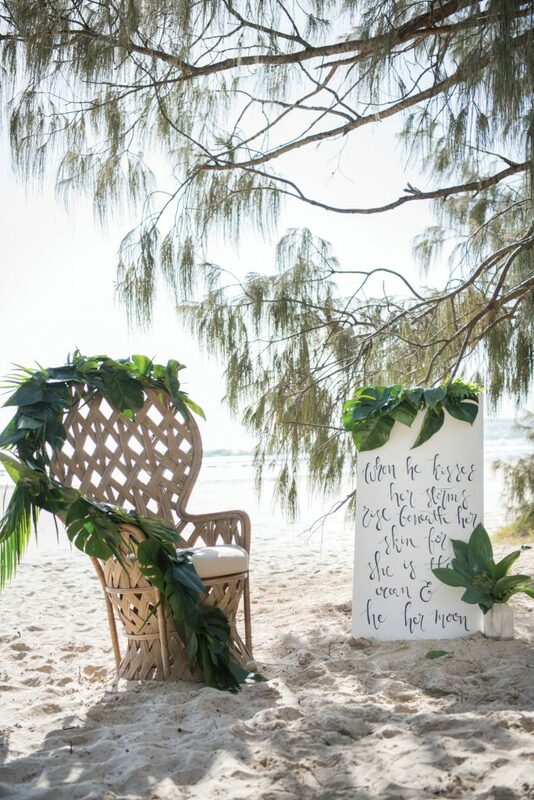 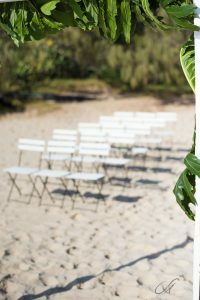 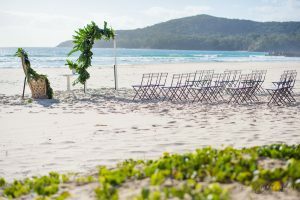 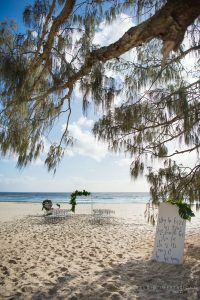 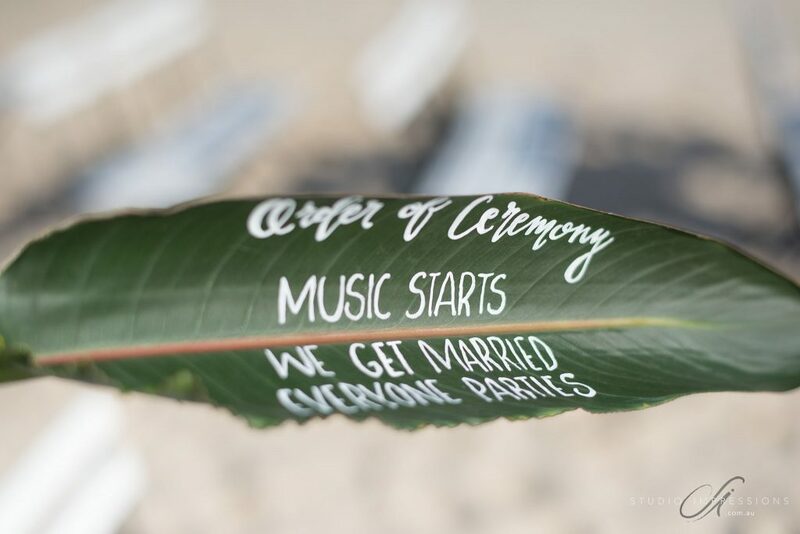 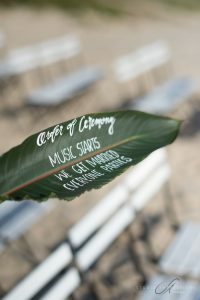 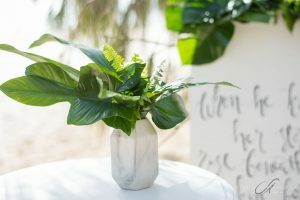 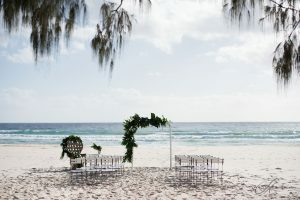 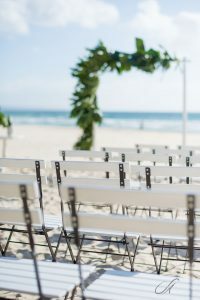 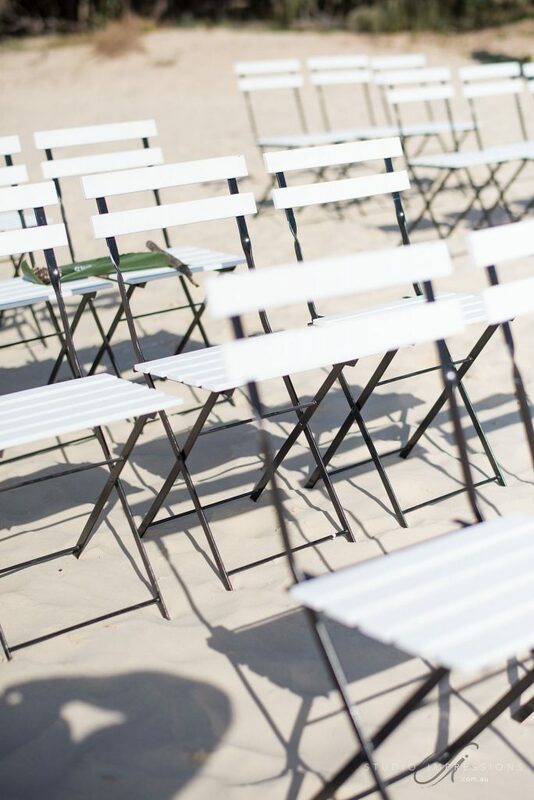 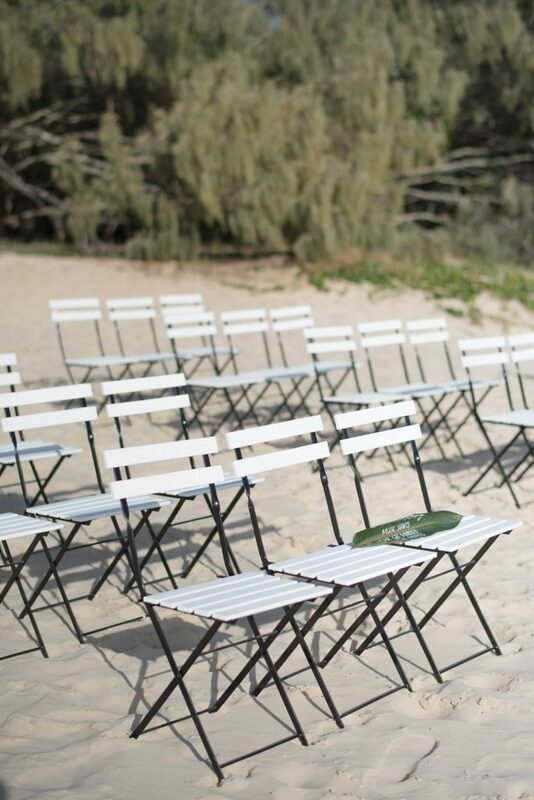 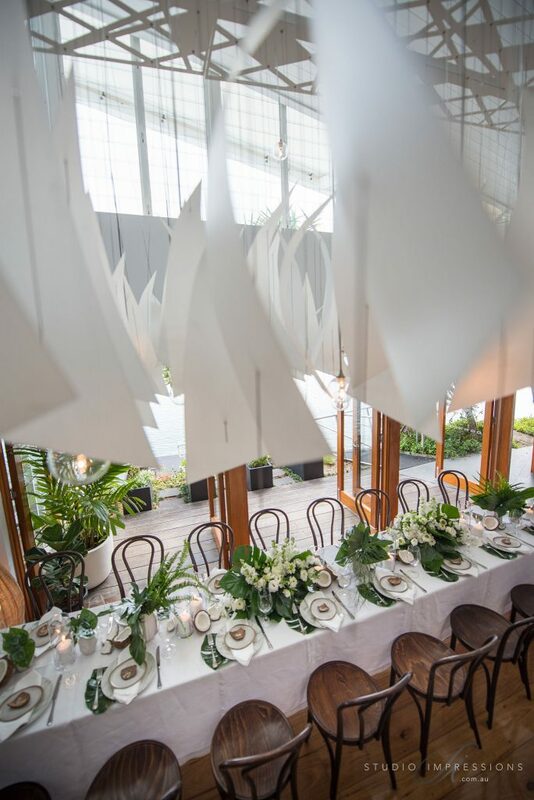 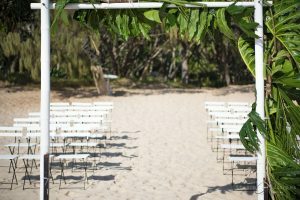 24 x white and black bistro chairs created the ceremony seating, and held the order of service created from large tropical leaves hand-painted with white script. 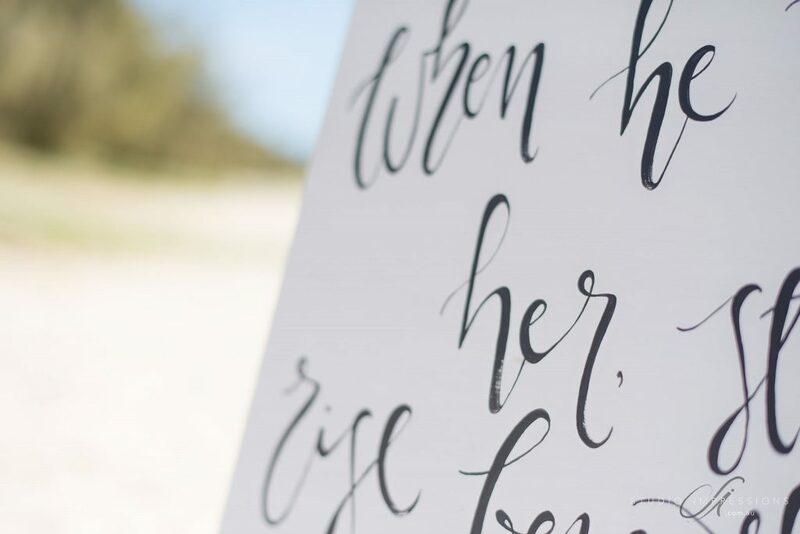 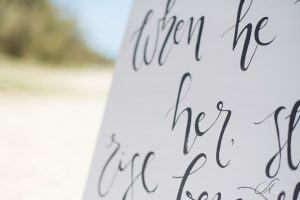 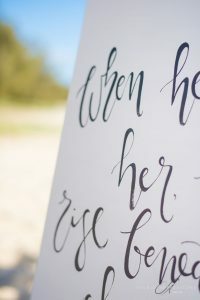 A white wooden entry sign with charcoal script tells of the love story about to unfold. 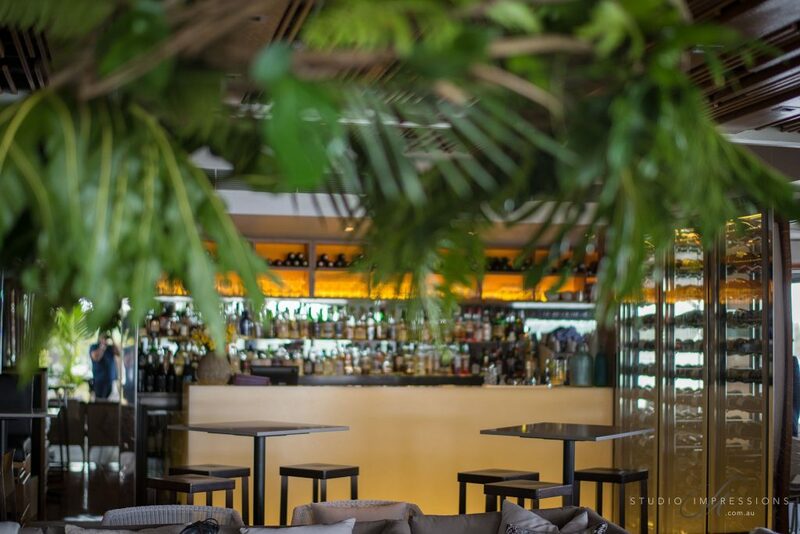 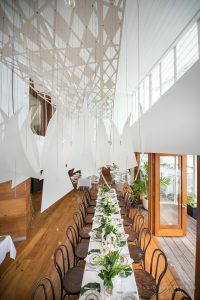 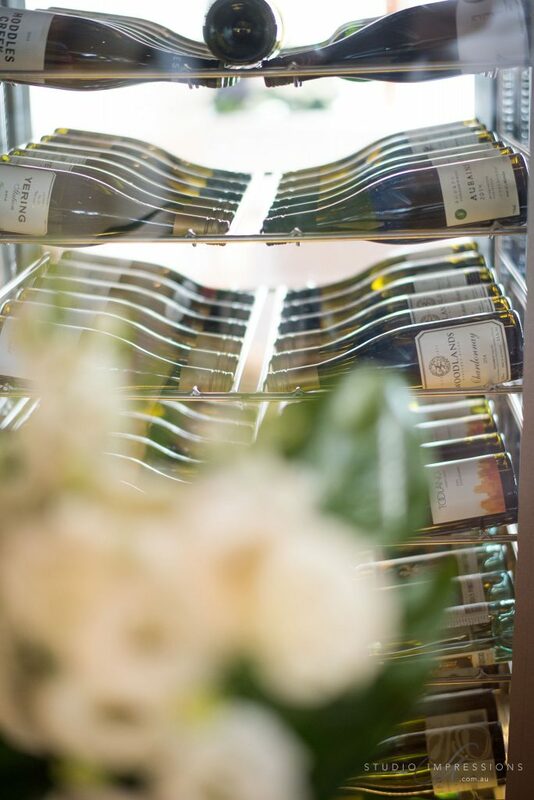 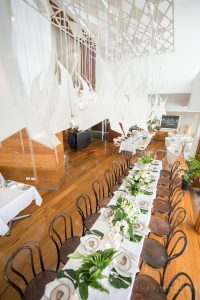 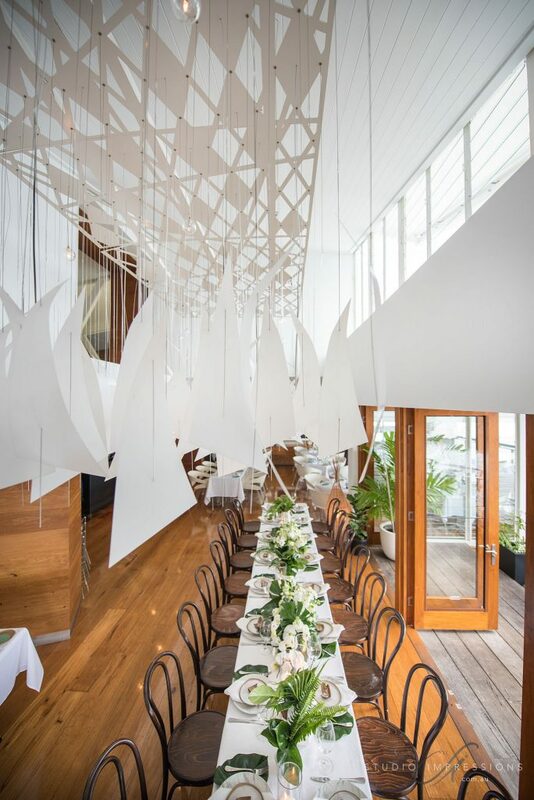 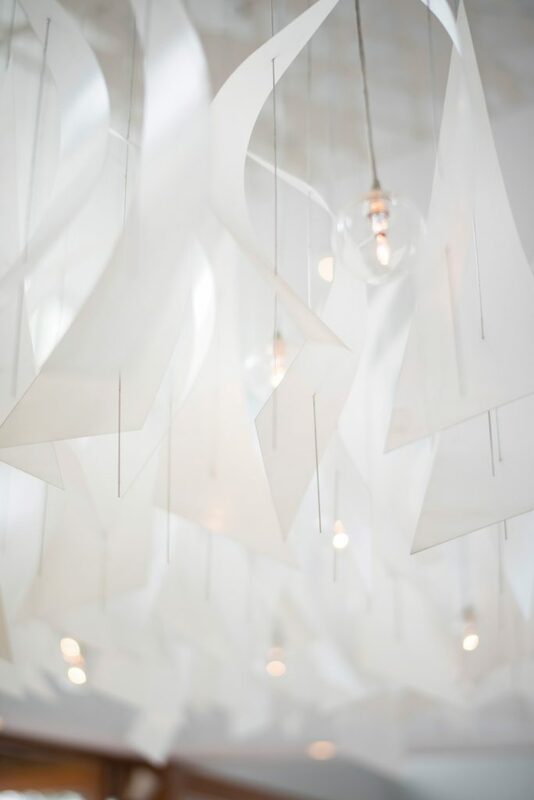 One long table was created beneath the lighting installation at Ricky’s…Our crisp white, hemstitched cloths bathed the timber floor creating a very clean and elegant base to the design. Dark oak Bentwood chairs bought a touch of rich timber to the design, drawing on the tones of the coconut husk. 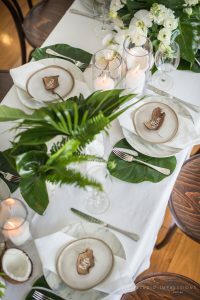 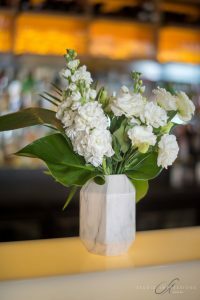 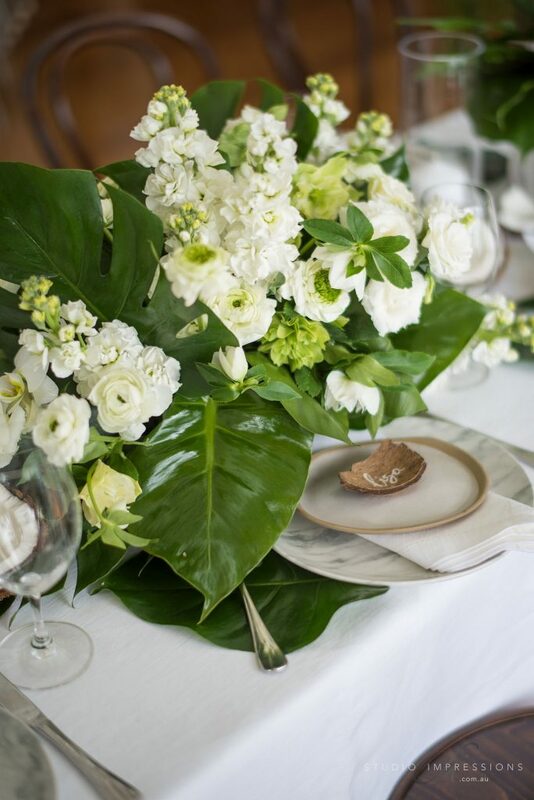 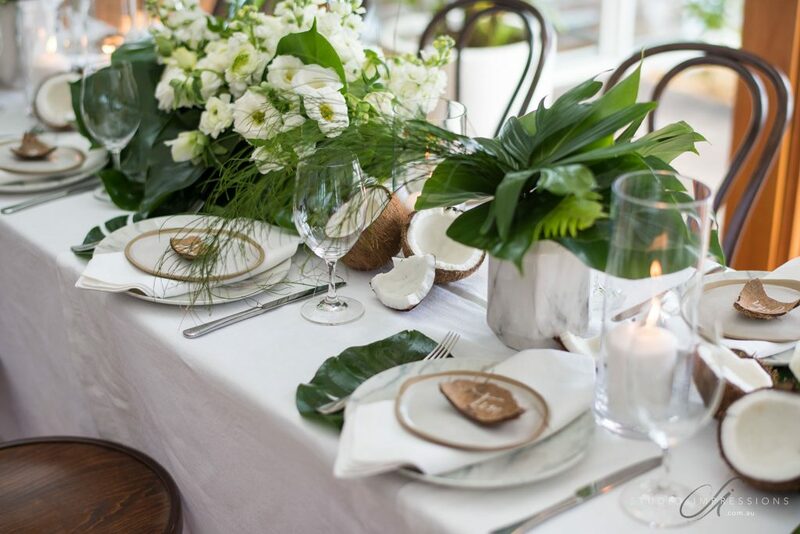 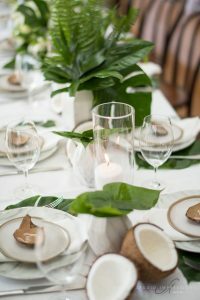 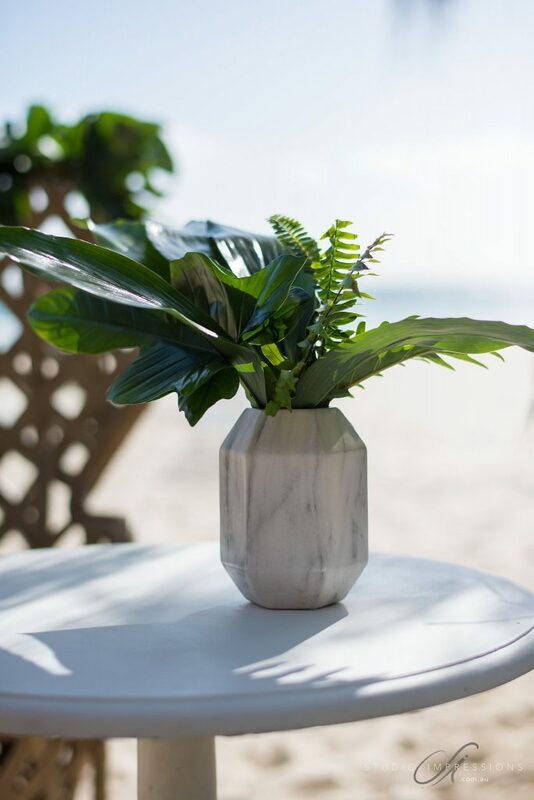 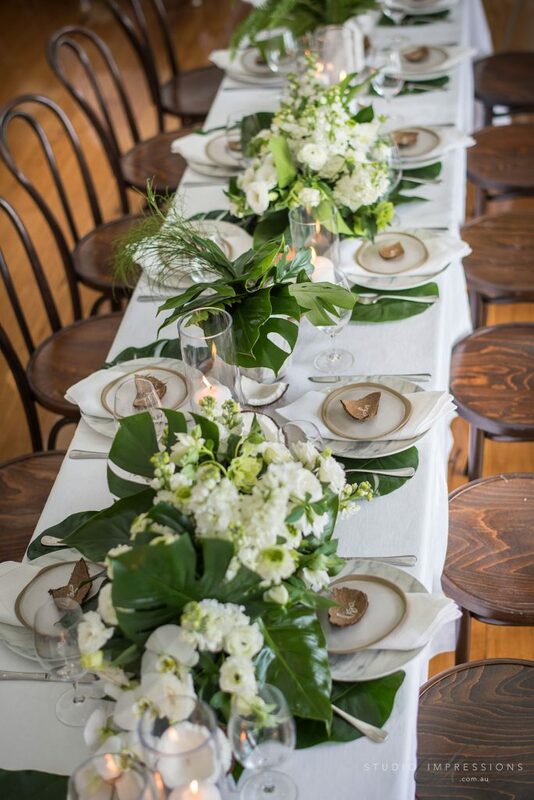 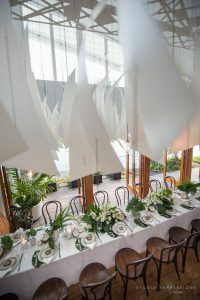 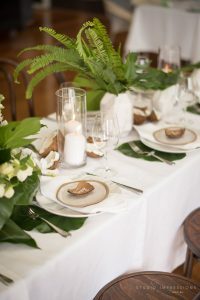 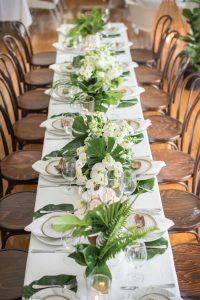 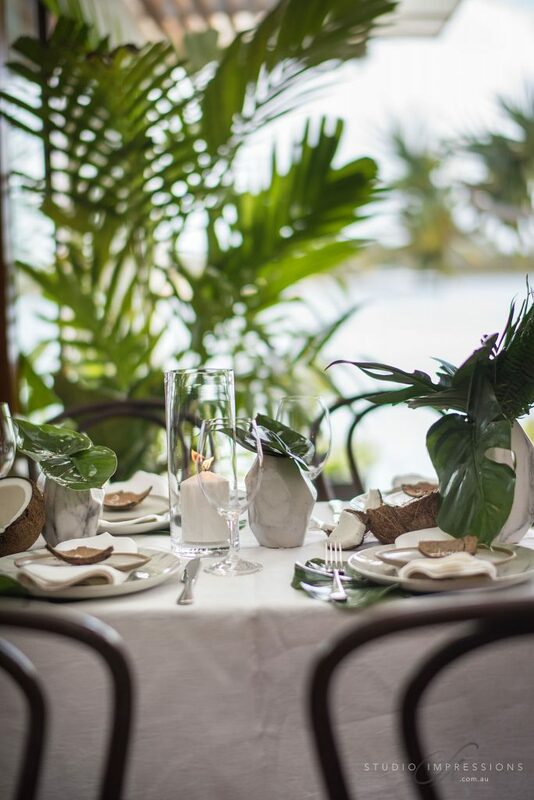 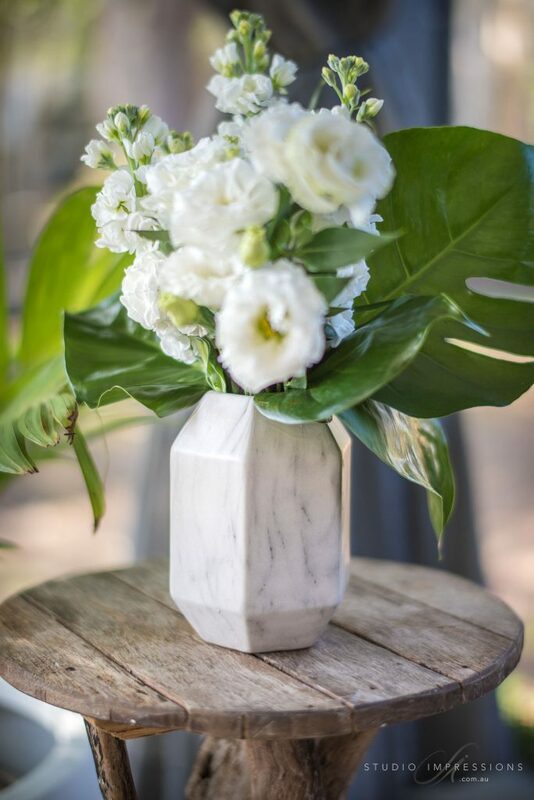 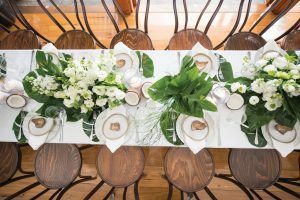 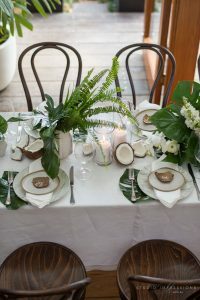 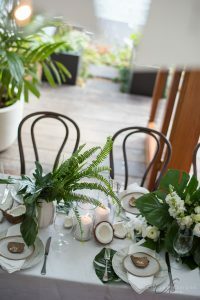 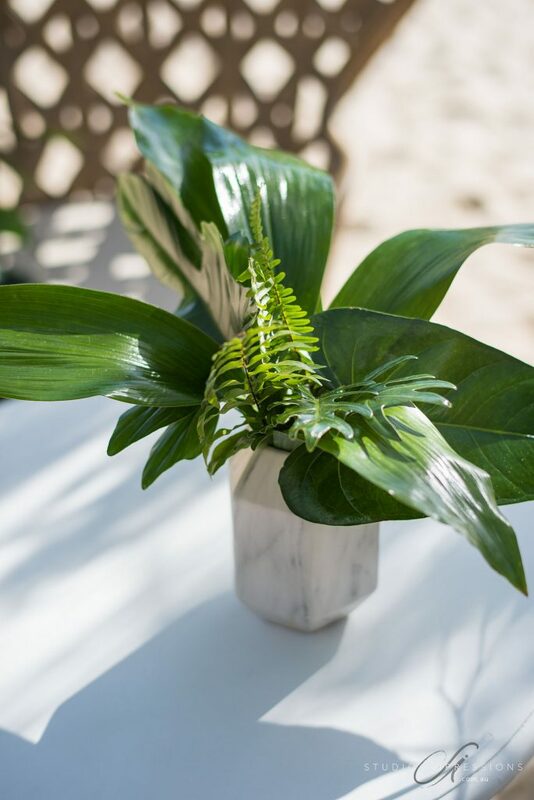 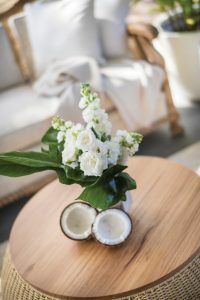 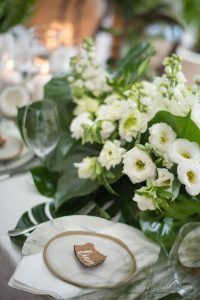 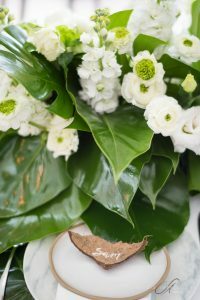 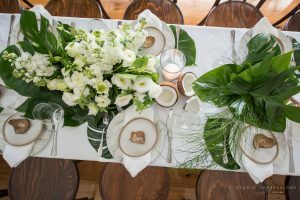 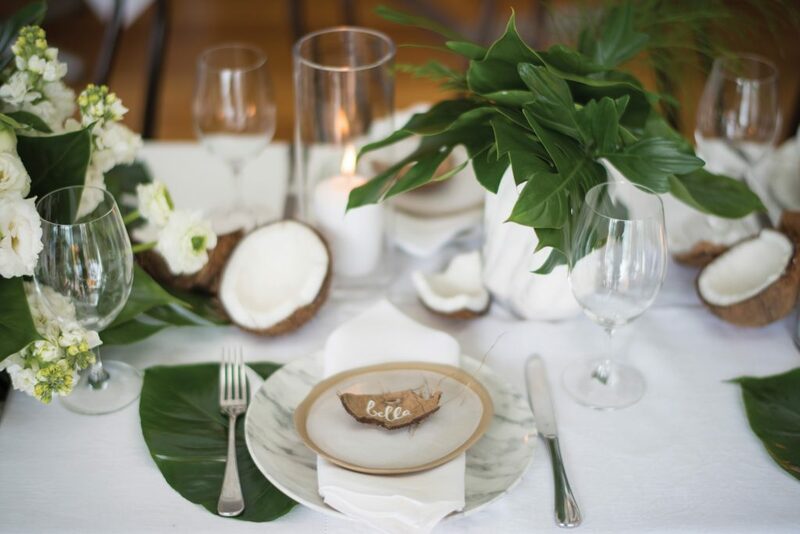 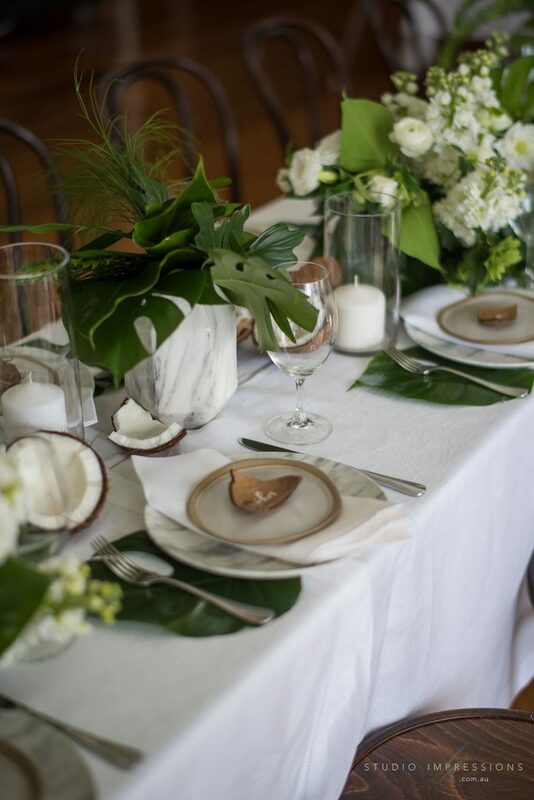 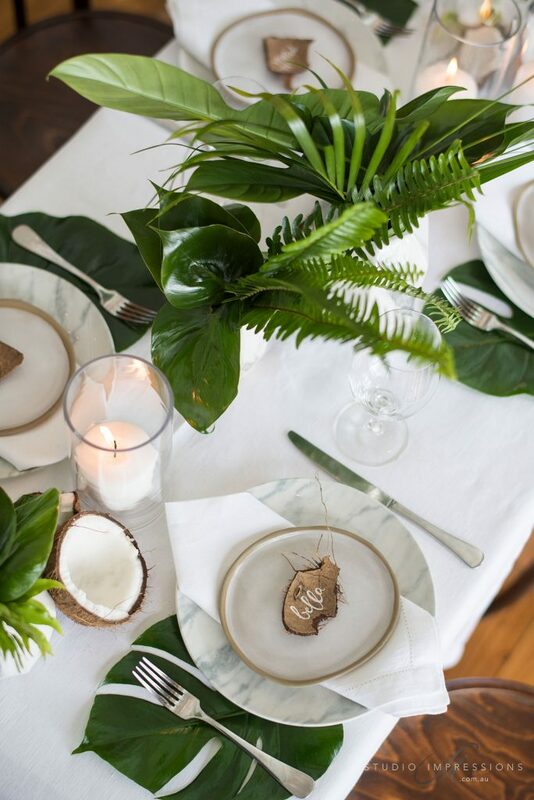 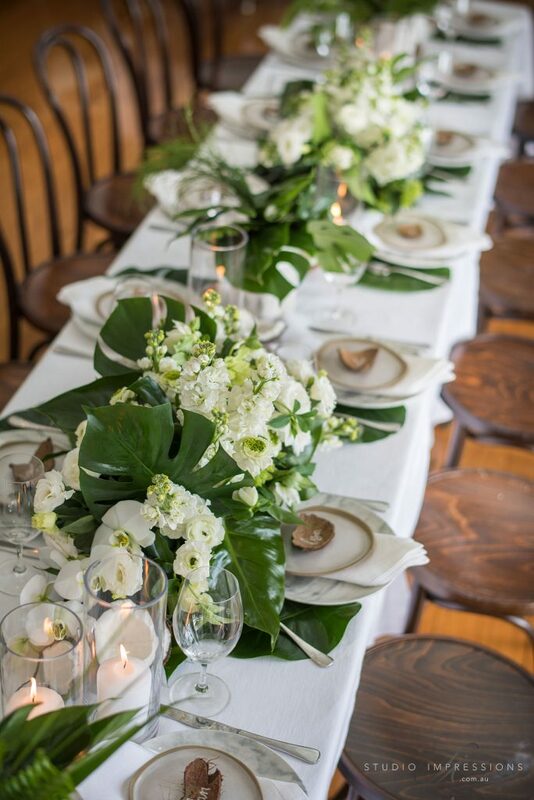 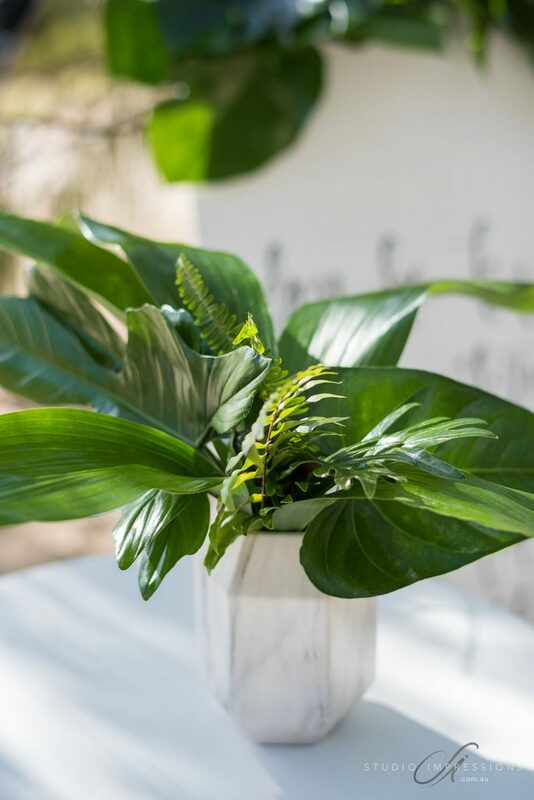 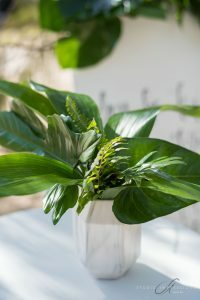 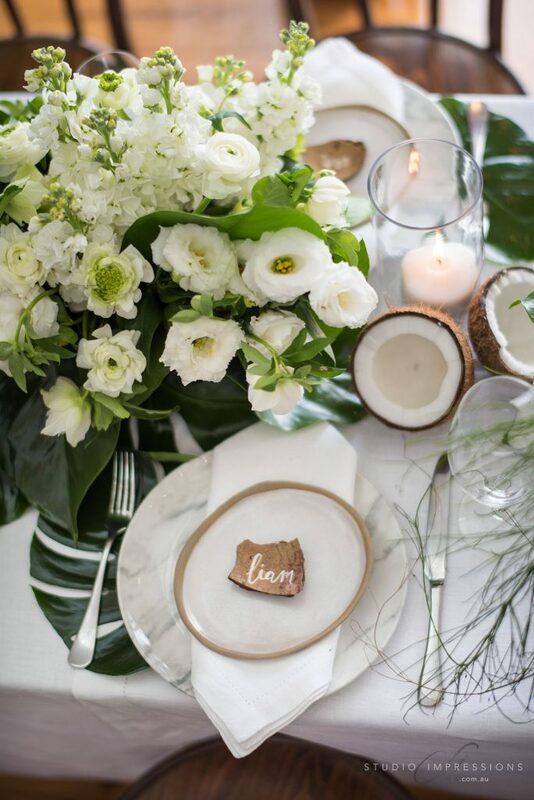 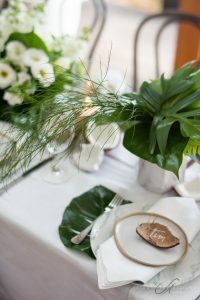 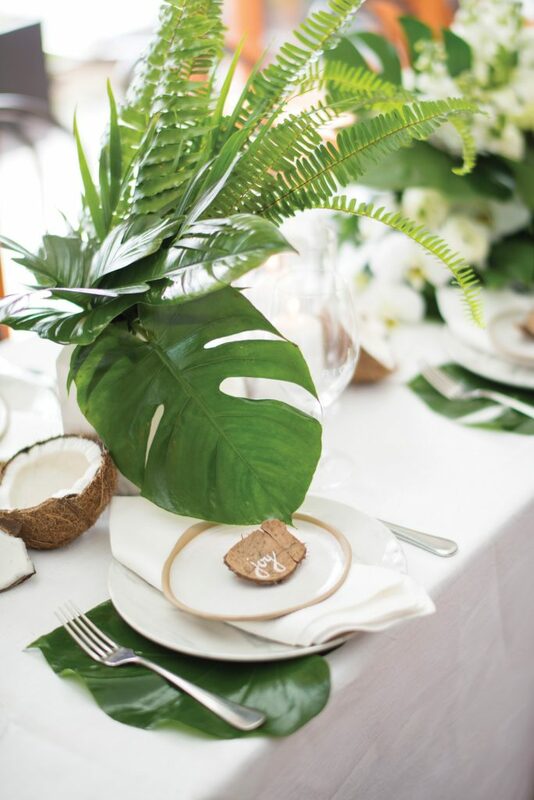 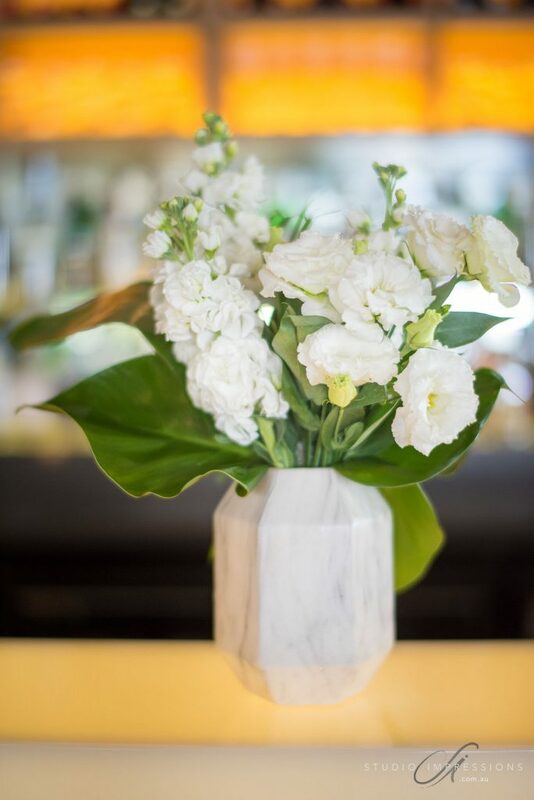 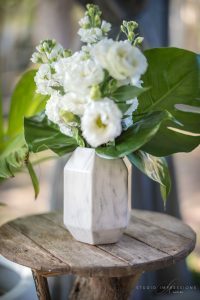 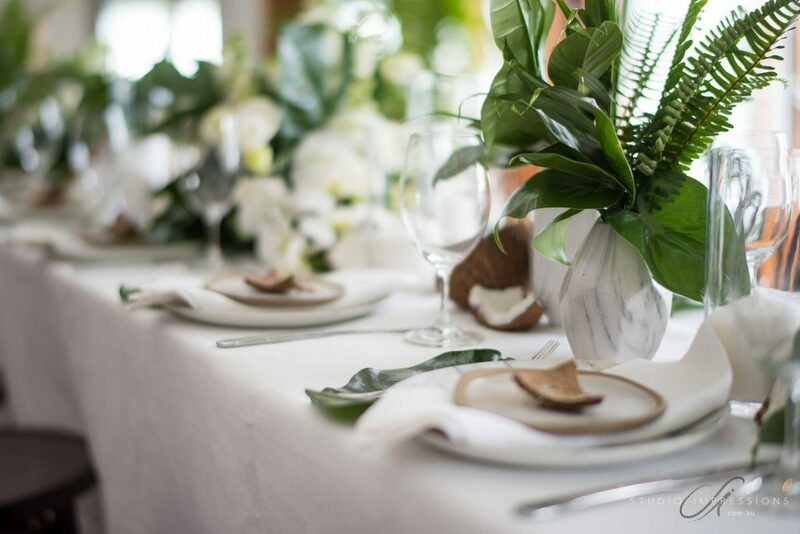 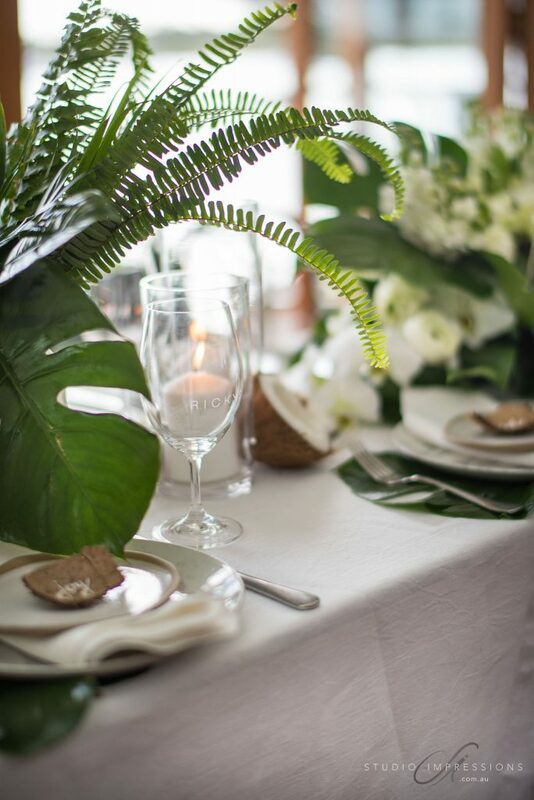 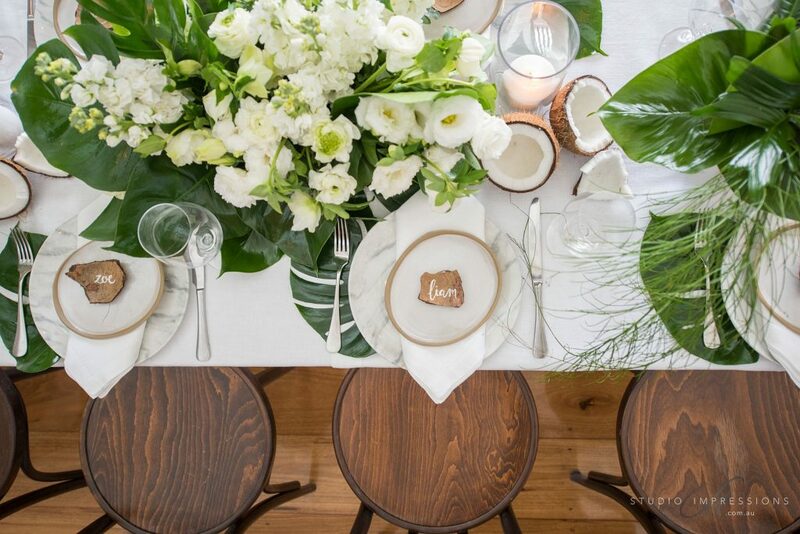 Table texture included the use of tropical foliage in marble vases and shattered coconut husks, which spilled across the centre of the table to create the runner. Glass hurricane lanterns were placed in amongst the table design for ambient lighting after dark. 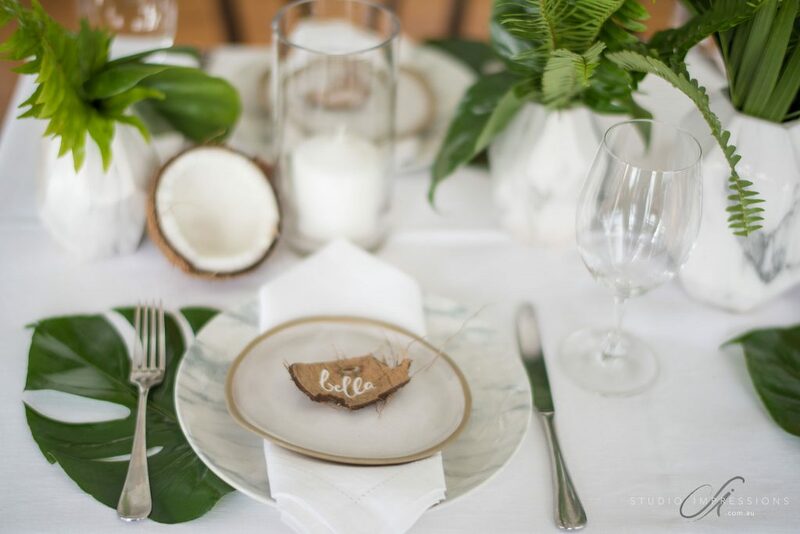 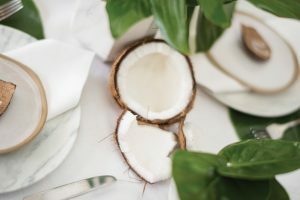 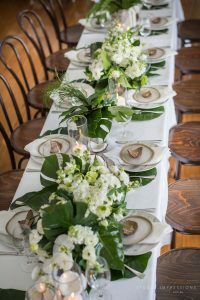 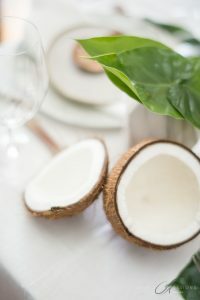 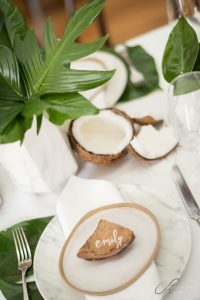 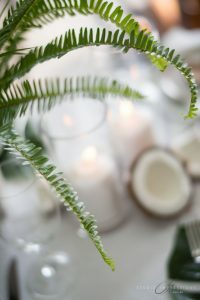 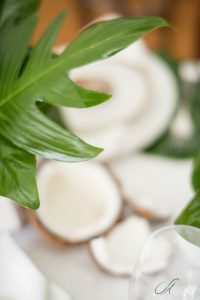 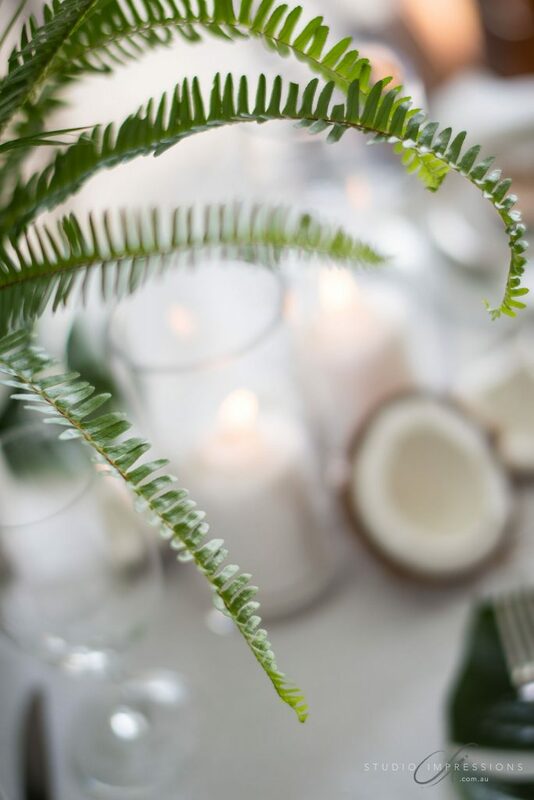 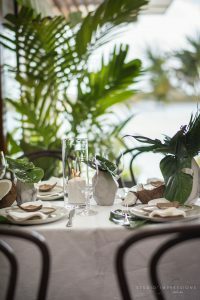 Each place setting included a layering of colours including a creamy main plate, white linen napkin, a charcoal side plate, and a coconut husk name place card. 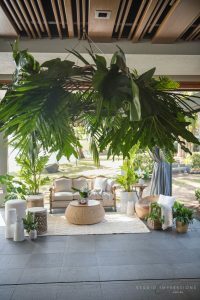 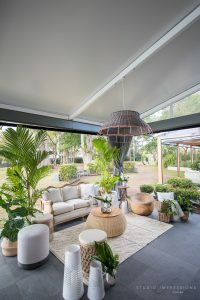 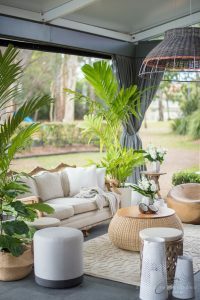 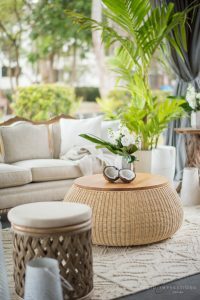 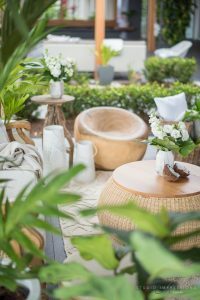 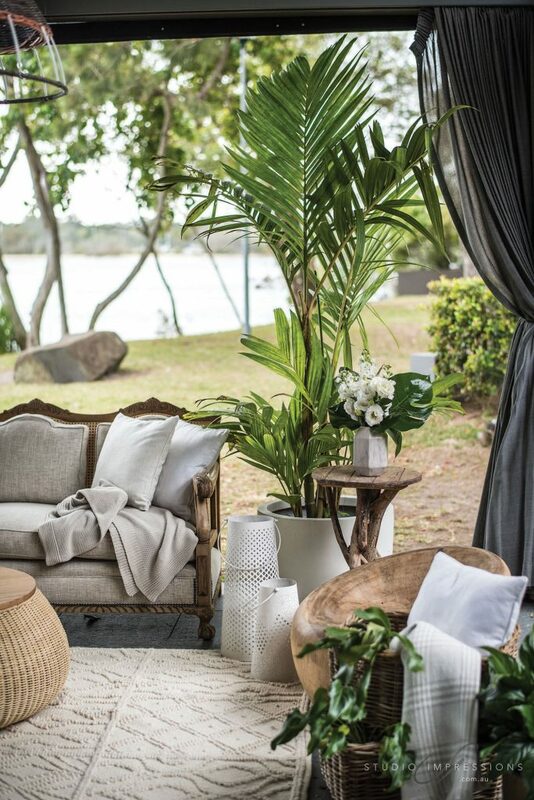 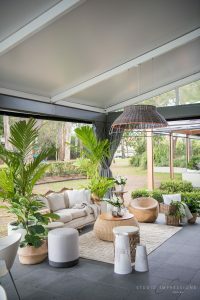 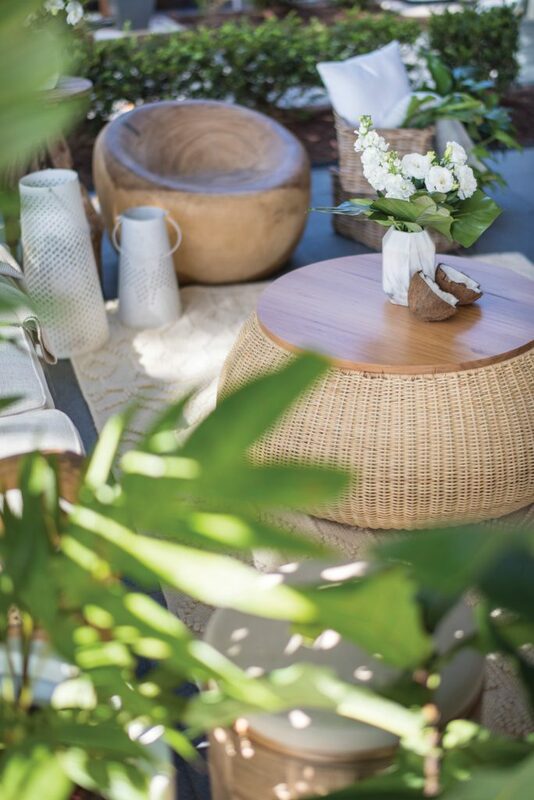 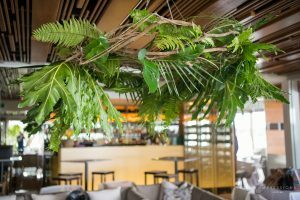 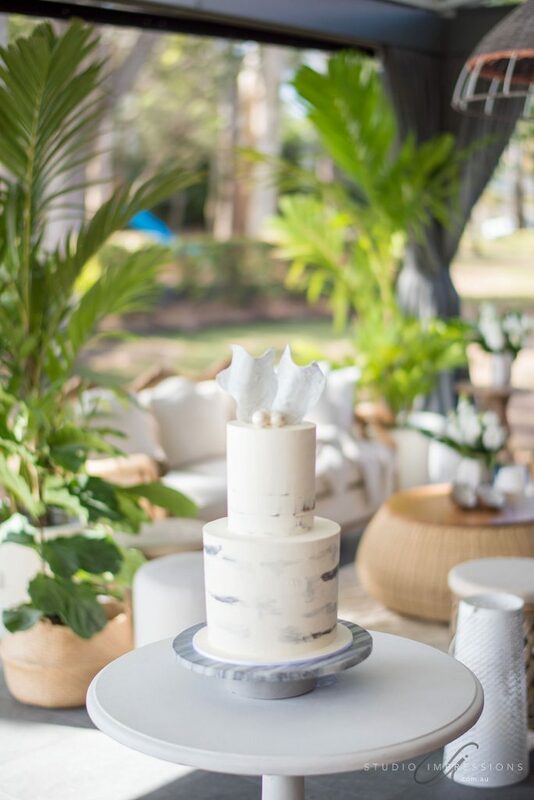 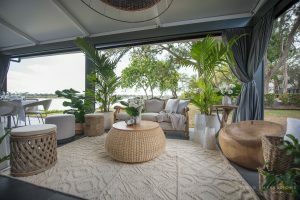 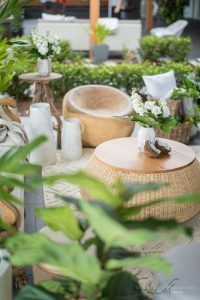 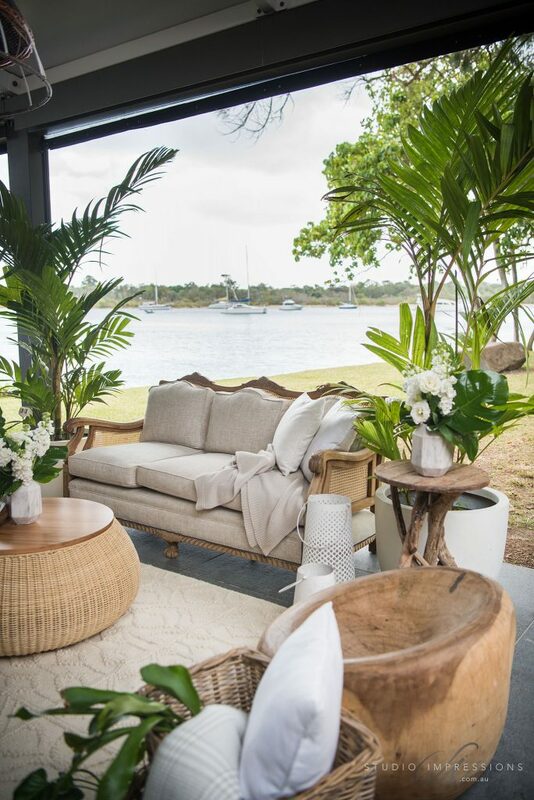 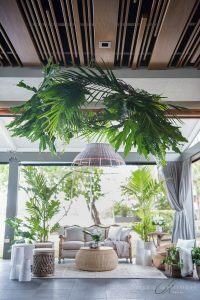 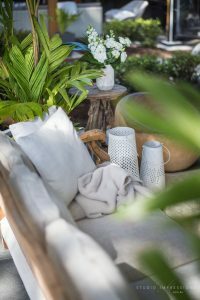 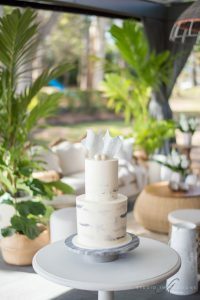 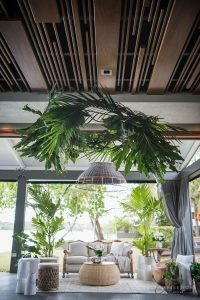 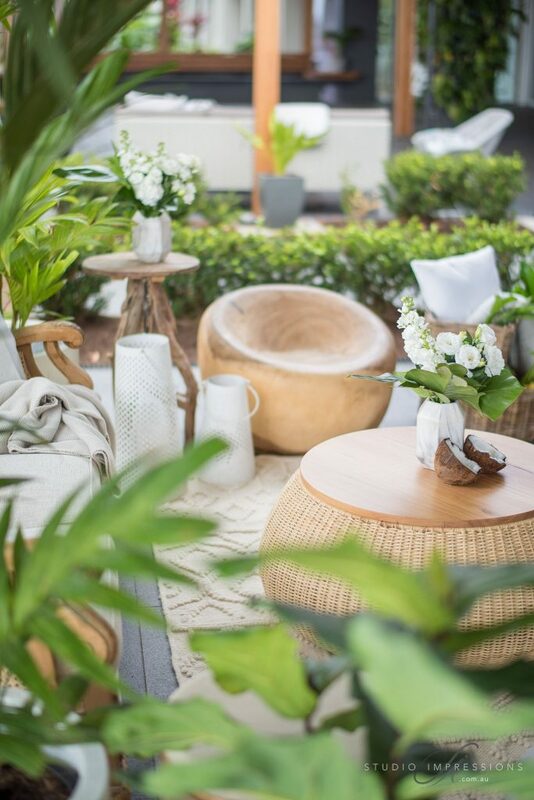 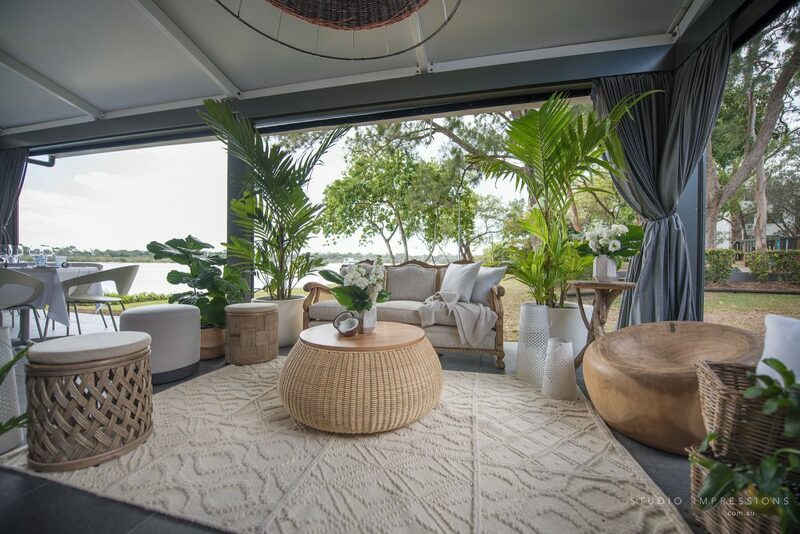 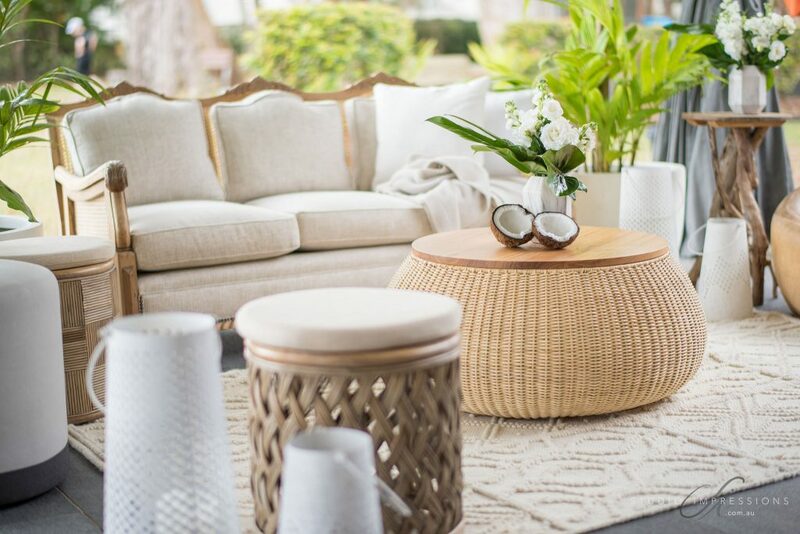 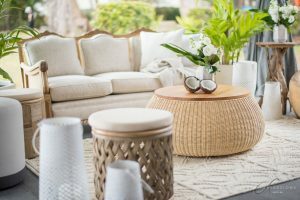 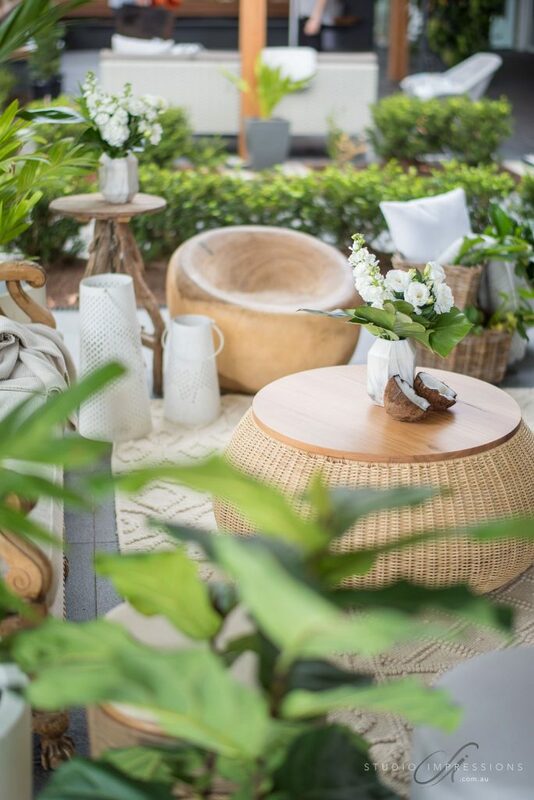 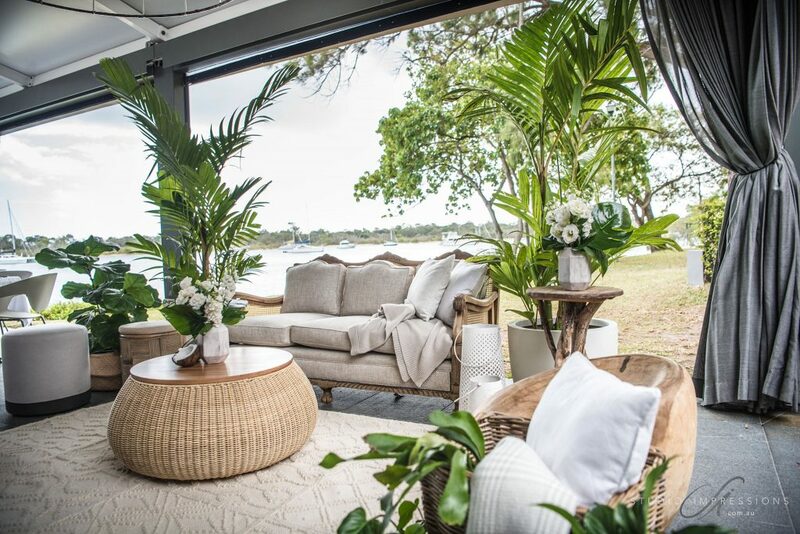 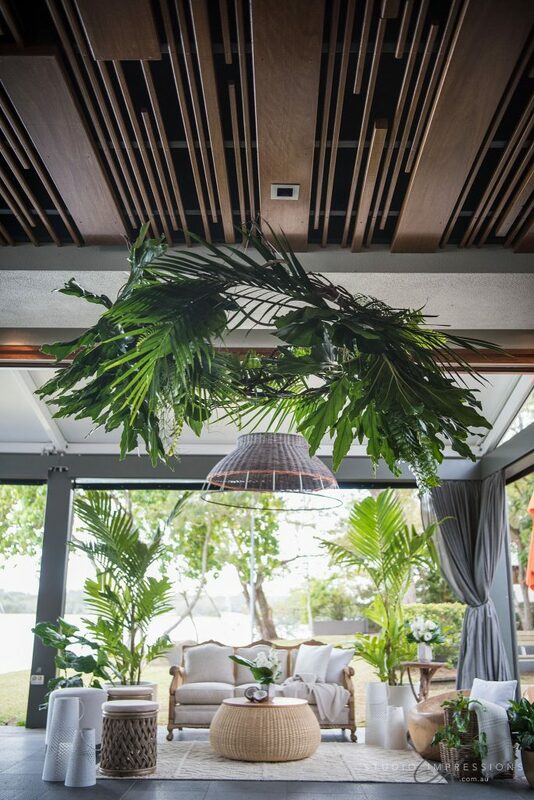 Overlooking the river, a feature lounge hosted a decadent array of ottomans, carved timber side tables, a round jute rug and linen Chesterfield lounge… A Safari chair created an inviting nook with a corner cluster of tropical foliage. 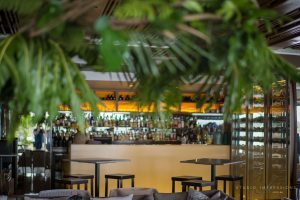 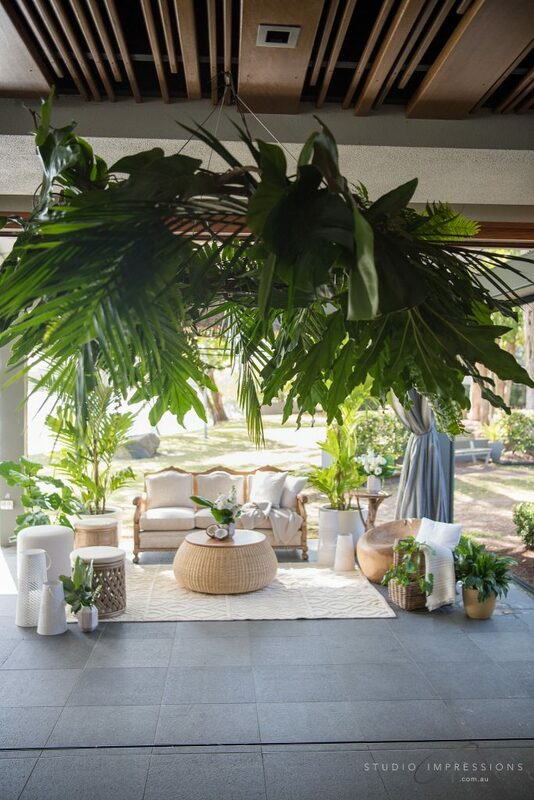 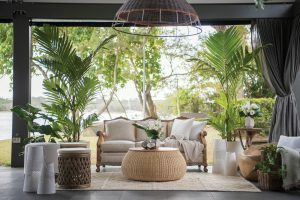 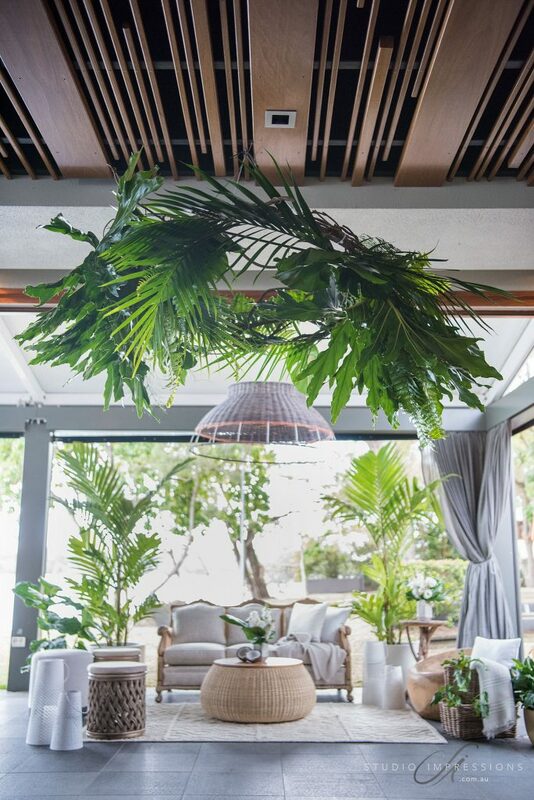 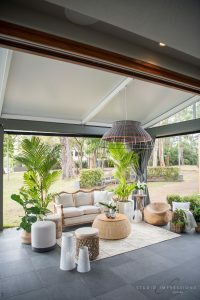 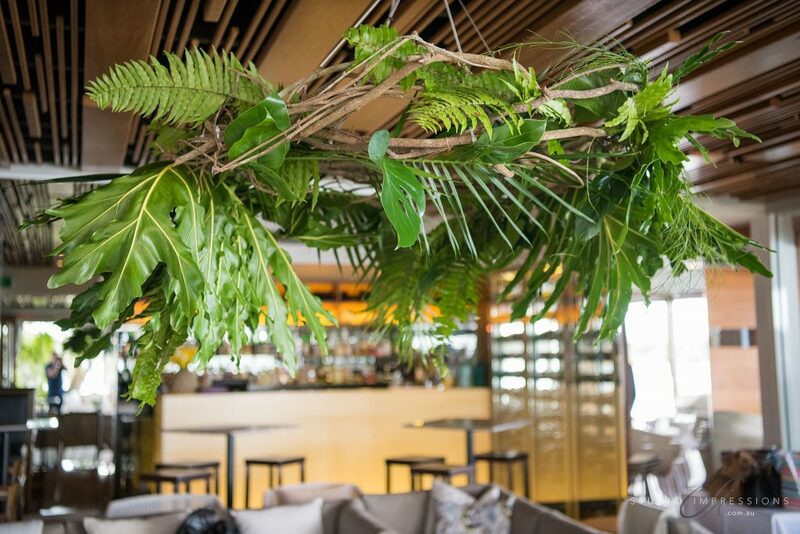 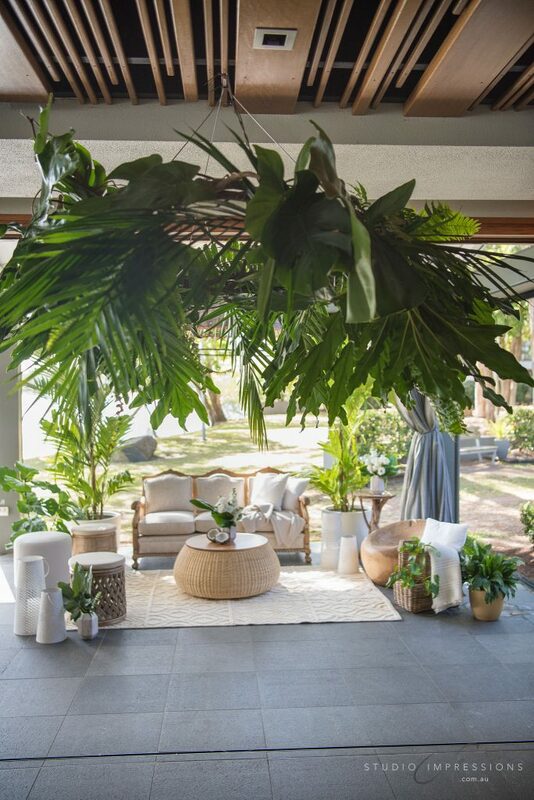 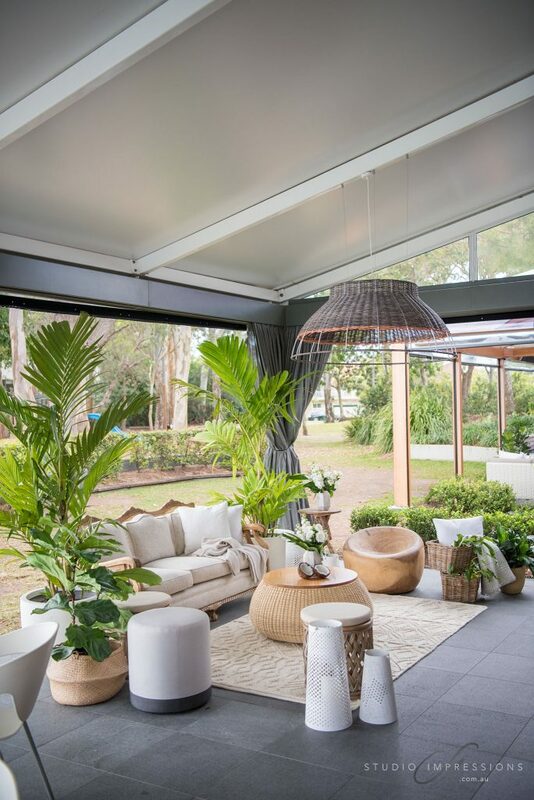 A collection of tropical palms, leaves and ferns in large glass bottles finished this elegant and relaxed lounge area. 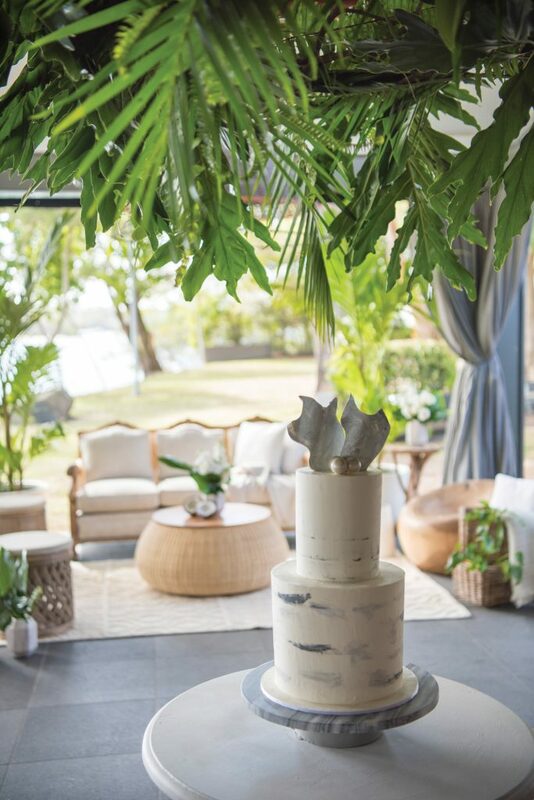 Cake Design’s marble cake was placed on a round white Louis table and above it hung 5 single globes amongst a floral halo of tropical greens.